Family is Everything. I have a close knit loving extended family and I know my parents would drop everything to help me in a time of need…because they already have. But I’ve learned I could reciprocate more. I’ll never forget spending the night in the Rio Gallegos, Argentina airport to catch a 3:45AM flight. As planes arrived and departed, whole families were there to greet or send off their loved ones. In the middle of the night. These weren’t curb drop offs either…this was holding hands, hugs, waiting at security to catch the last glimpse, then standing pressed against the window watching the plane take off. We get so busy — putting work and our needs at times ahead of those most important to us. The priority I’ve witnessed being given to family and friends in EVERY culture we’ve visited has made me reaffirm my commitment to be a better daughter, sister, friend, coworker. But Time Apart is Healthy! The three people in my immediate family are my most favorite people in the world. But golly I am sick of them! And the feeling is mutual. It’s not normal to spend eight months attached at the hip. We’ve spent half of this trip sleeping in the same room. We’ve played more UNO and cribbage then I could possibly imagine. We are all looking forward to more balance and privacy. I Need to Give Our Children More Credit. I am a firm believer that adversity makes for a better person. 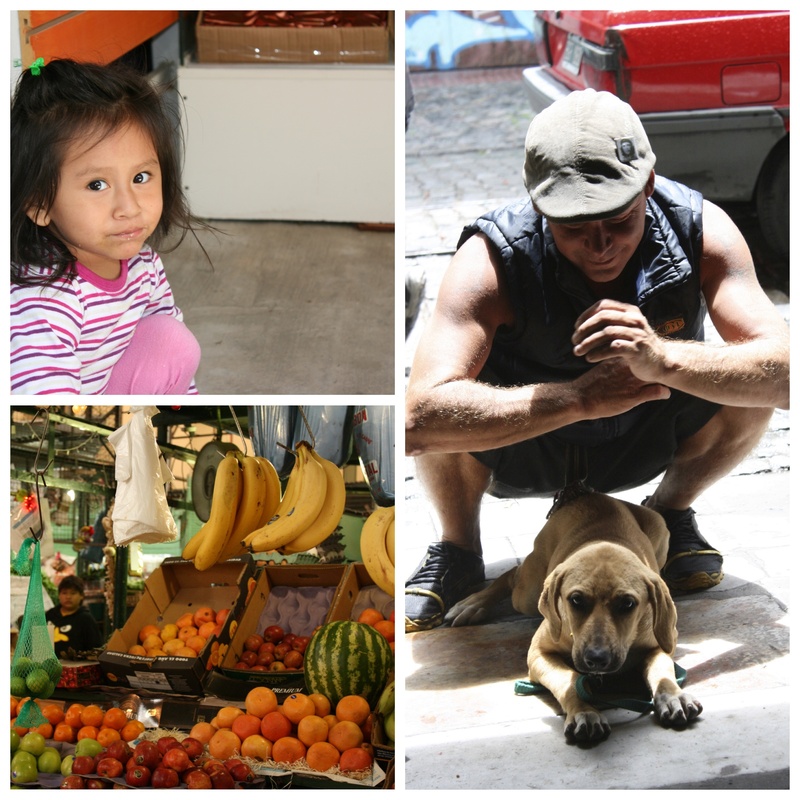 Before the trip, I felt the children wanted for naught and had no idea how lucky they were. Long term travel drives adversity. The kids have slept outdoors on a hard bench during a typhoon, they have hiked through knee deep mud while picking leeches off their skin, they have had conversations with so many people of different cultures, they’ve seen kids their age working the fields instead of in school, they’ve bravely tried foods far outside their normal repertoire, they’ve seen that people live without heat, hot water, technology, new clothes. They have learned it’s ok to be uncomfortable. They reluctantly came along but they rose to the challenge and I am grateful for who they are becoming. But My Husband is a Flippin’ Rock Star! I don’t know many 45 year old men who would put their lives on hold to follow their wife’s dream when that dream included a backpack, youth hostels, and little access to a good IPA and your football team’s 1st Super Bowl win in a long time. Now obviously Kyle is deeper than all that but this was my dream, not his and he was 100% supportive in living this past year through my vision. Love that man. Every Government is Flawed, Some More then Others. Every country is struggling in some way…corruption, poverty, too much power. There is no utopian approach. We live in a powerful and free country and that comes with both pride and shame. In every country we visited, there was a common thread of war and covert involvement by the U.S., particularly during the 1960s and 70s. In Laos and Cambodia, we saw young men missing limbs from U.S. cluster bombs. We also met with young students in these countries learning English because they see it as the ticket to success and harbor no ill will against the U.S. In fact, these kids dream of a Californian life but likely will never receive the financial support or visas to do so. We heard from SE Asia to South America, “our government is corrupt.” It actually made me appreciate my own government more, however flawed. But it’s the People that Make a Country. Discussing politics with Dew and Juan over pizza in Urubamba, Peru. Enjoying fresh baked muffins with an Austrian grandmother in Reutte. Discussing dreams versus obligations with a Japanese innkeeper. Universally, it’s the people that have created our view of the countries we visited, not the government and we hope the feeling is mutual. We Don’t Need to Reinvent our Life. When we started this trip, I was looking for something. I felt trapped by material gains and wanted to simplify. Now, don’t get me wrong, we are not a “keeping up with the Joneses” family. We don’t drive fancy cars, or spend money on anniversary gifts, or own vacation properties. But we have our electronic devices, a big screen TV and, yes, I have an occasional rampage through Nordstrom. Do we need to strive to continue to be better people? Yes. Do we need to give back to the causes and people that grabbed our hearts both before and during our trip? Absolutely. But I am 100% grateful and satisfied with our life…and it only took 243 days and 26,863 air miles to realize that. This will be our last blog post. I start back at work in two days and our heads are forward focused. Thank you for following our journey…we felt a lot of love while we were on the road. 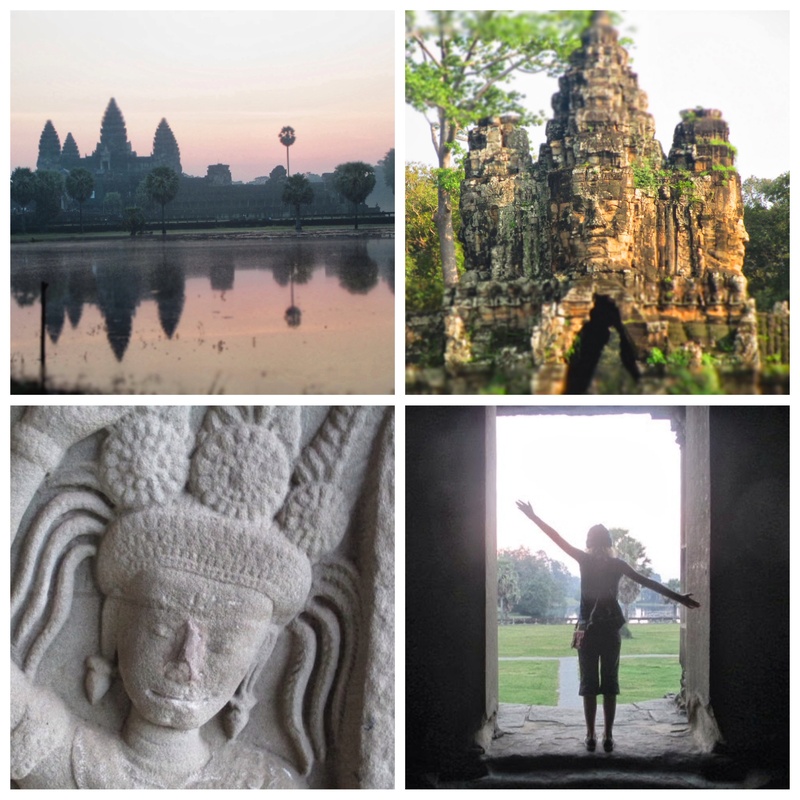 This blog now serves as a memory bank for my family and I hope a resource and inspiration for future traveling families. There’s a vast, amazing world out there full of wonderfully warm people…go get it! Before arriving to Copacabana, we spent three nights in La Paz, enjoying the beauty of good wifi. La Paz surprised us. We expected not to like it. Our tendency is for small and quaint, not sprawling and chaotic. But the city was unlike anything we’d ever seen…a deep valley surrounded by jagged, rust mountains with thousands of small red brick angular homes built on every possible spot. 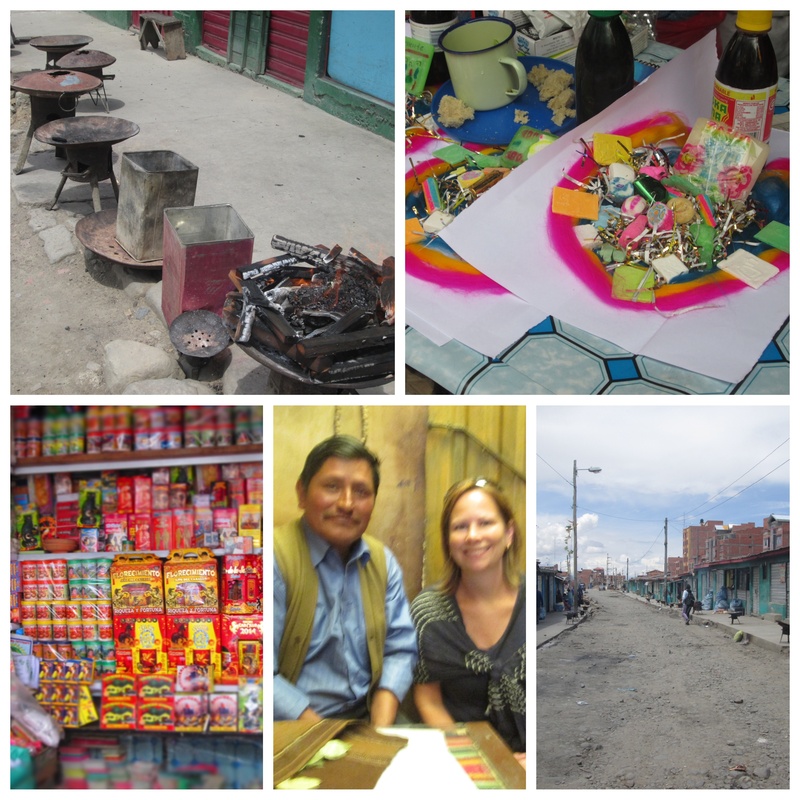 When you first see La Paz, you think “there better not be earthquakes here.” And there’s not. But flooding slowly erodes part of the city each season, with some homes being abandoned with the threat of landslides. 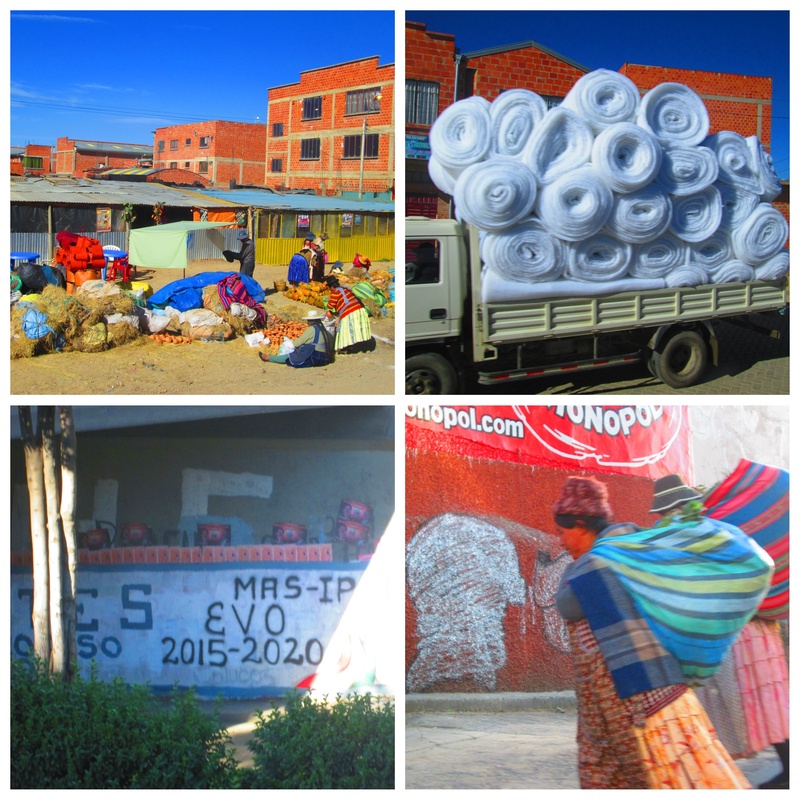 We had purposely booked a hotel at the south base of La Paz, in an effort to sleep at 10,000 feet vs 14,000. 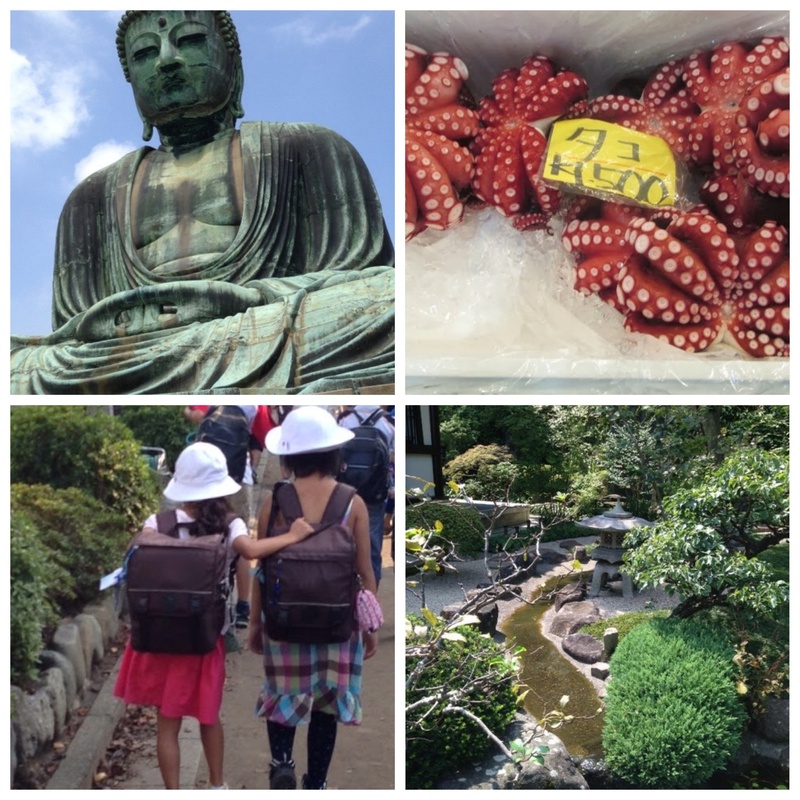 Calacoto, the embassy district, had coffee shops, Japanese food, and loads of wonderfully green parks. Our time was brief…two full days…we should have spent much longer. 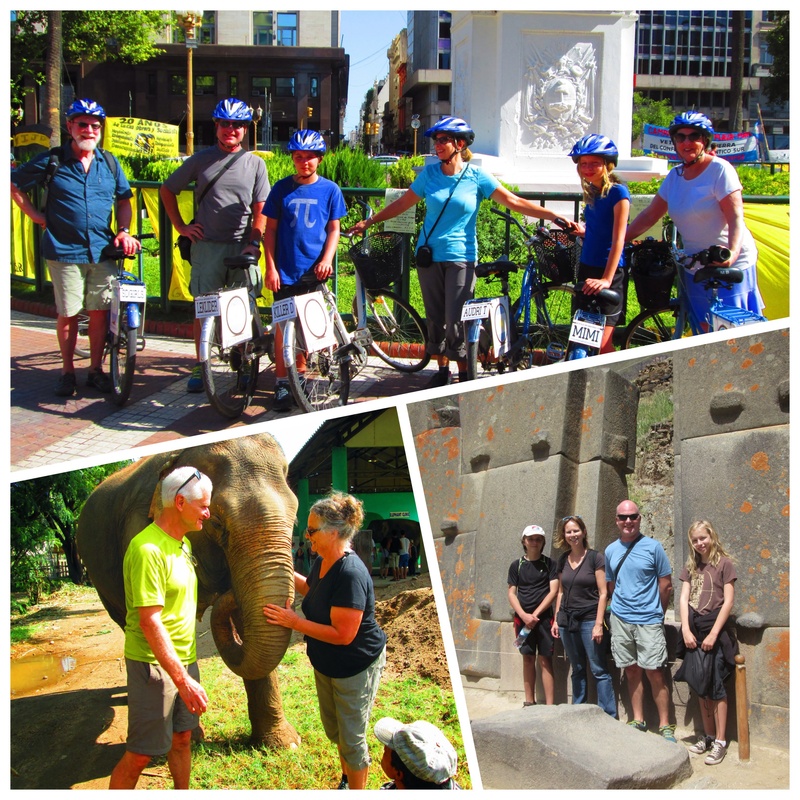 We spent a day with Sergio of Banjo Tours, a private tour company that purports off the beaten path tours. Kyle said it was the best tour we’ve been on during our rtw trip because he didn’t see a single tourist the whole time. We met at the Basilica San Francisco where Spanish Catholicism and Native Aymara is uniquely melded in a way that must be unparalleled. 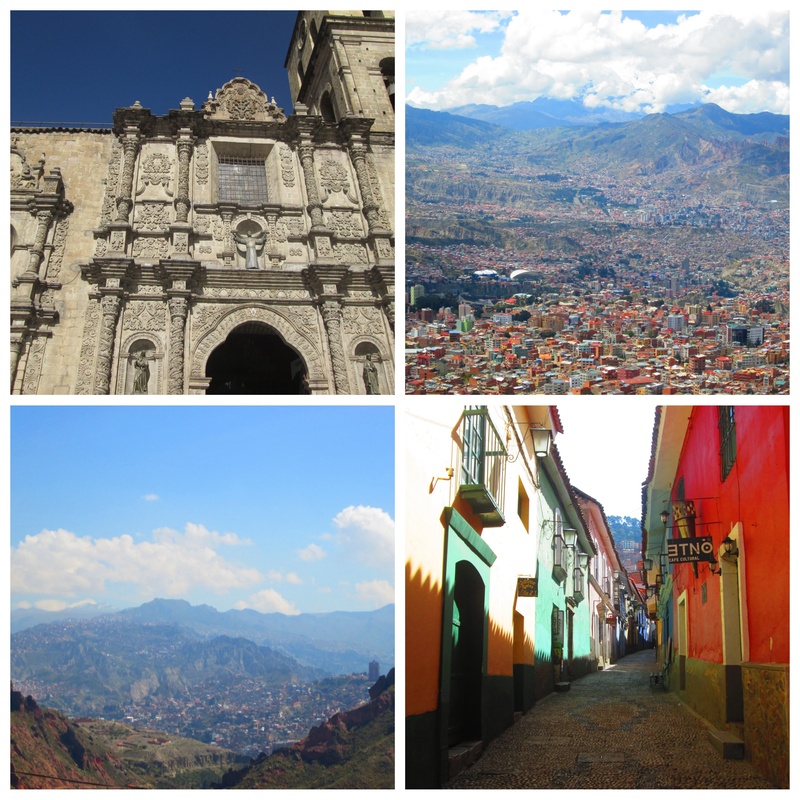 We walked up to the Spanish section of town with its narrow cobblestone streets and colonial buildings. 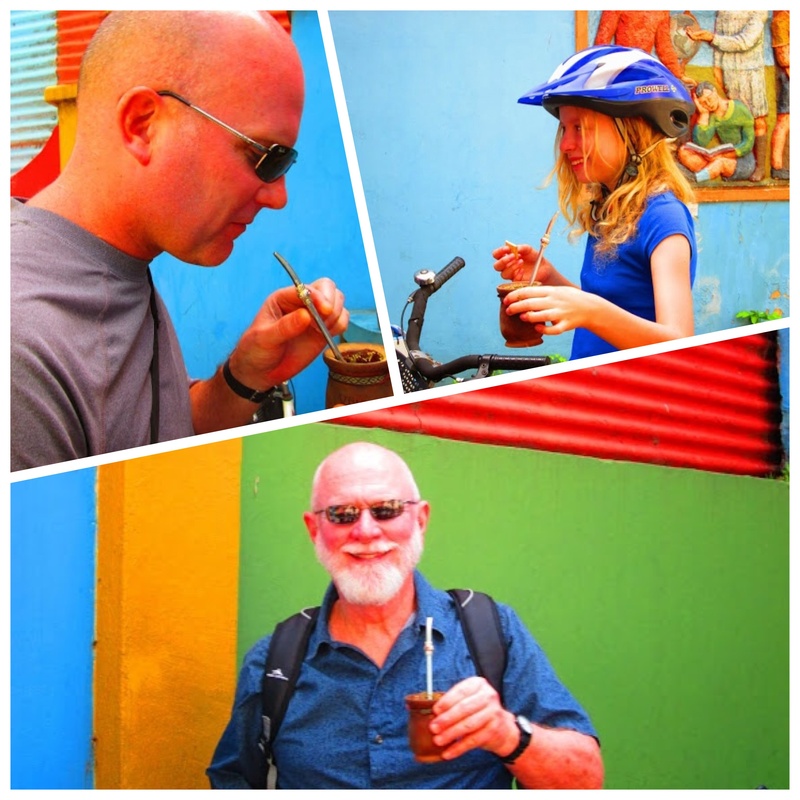 We stopped to try salteños, Bolivia’s version of the empanada, and despite warnings from Sergio, dripped it all over our chins and shirts. It was worth it. We stood in the public square across from the infamous jail and heard its unique history…where inmates run the show inside with hot tubs and big screen TVs and endless drug parties, while the police guarded the outside. This jail for years offered tourists tours and drug parties. And even on this day, we watched as three young backpackers with plastic bags of toilet paper, bottled water, and other things they thought might be useful to the inmates, stood looking on, hoping that they would still experience what was on the inside. This jail, in the center of the city, at the edge of a beautiful plaza, would be closed down in two months time and parents of foolish traveling youth should be grateful. While we watched, a small bronzed, barefooted man with a decidedly New York accent came up to us introducing himself as David from the Bronx and claiming that he just got out. Our guide later told us that he’s not really sure David was ever in the jail but looks for tourists to tell stories to for tips. A career path that never occurred to me. 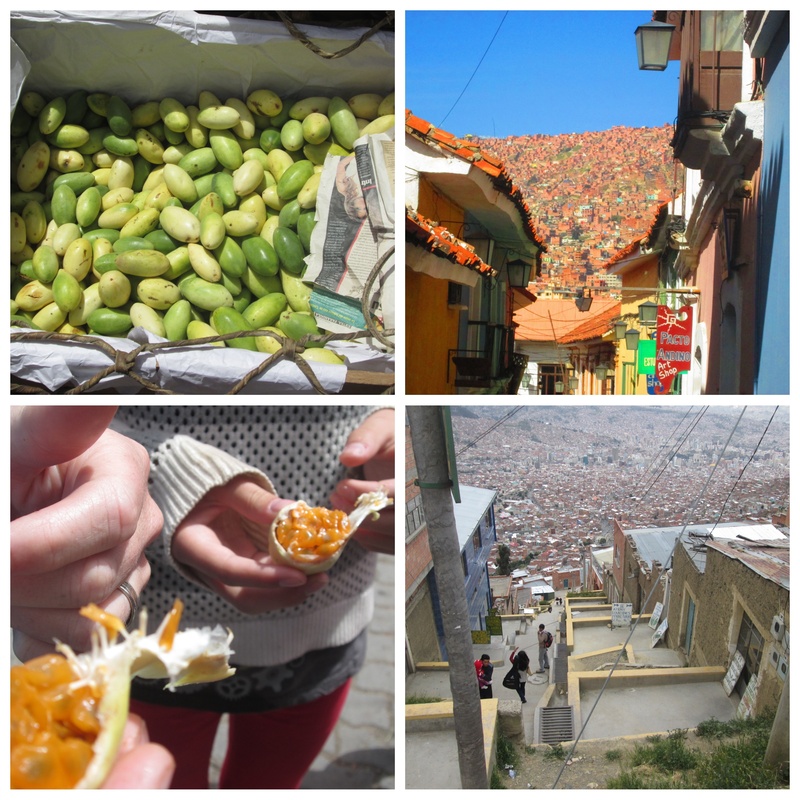 We went to El Alto (the tall) neighborhood at the top of the city and took in the endless views of La Paz, as well as the produce markets where we tried a new fruit, tumba, and Julia determined she must start an import/export business to bring this sweet but sour fruit to the states. 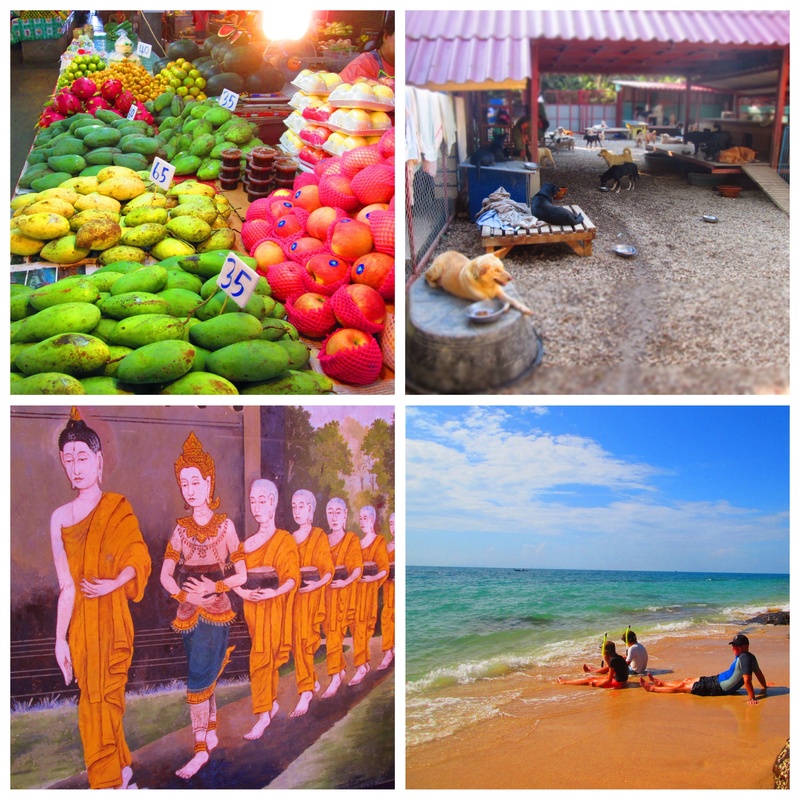 Our last stop was the witch market…this being the locals market vs the tourist market back in the center. 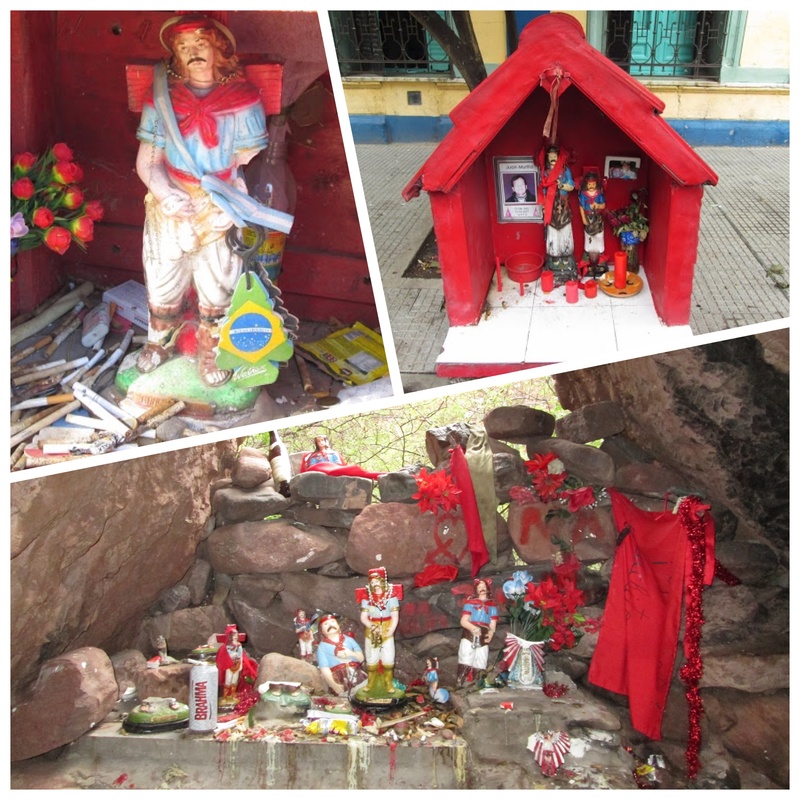 Sergio explained that offerings are a daily part of Bolivian life, modern family or not. The fetuses of llamas, pigs and birds hung dried above our heads. Kits of molded sugar with different themes…a new car, money, a house, love…piled high. Had we purchased a kit, we would have then taken it a street away to the witch doctors, who would burn it for us and add their own power to make our wish come true. As we couldn’t come to terms with burning an animal fetus, we simply met a witch doctor, who of course looked like a college professor who just happened to have a human skull on his desk. He read my future with coca leaves and accurately captured both my personality and my likely trajectory in health, work and love. Time will tell his accuracy. I was able to get my requisite political conversation in…always a little touchy and requires judging your audience. Especially considering strained political relations between our two countries (nationalizing industry and diverting planes sort of leads to that). However Sergio was game. We’d heard time and again that Juan Evo Morales, the first Aymara President, was immensely popular among the people due to his Robin Hood focus. Expanded healthcare and schooling was pointed to as much improved under his terms. Similar to the U.S., the Bolivian constitution calls for two 4-year terms max per President. Mr. Morales is finishing up his 2nd term…and then running again. It was explained to me that a new constitution was created in 2006 during his first term and thus that term didn’t really count. The people and the military appear to be behind a seemingly well intentioned and effective president. But there’s always a minority and here it’s the rich, and even if you’re Robin Hood, thinking you’re the only one for the job is a dangerous path. 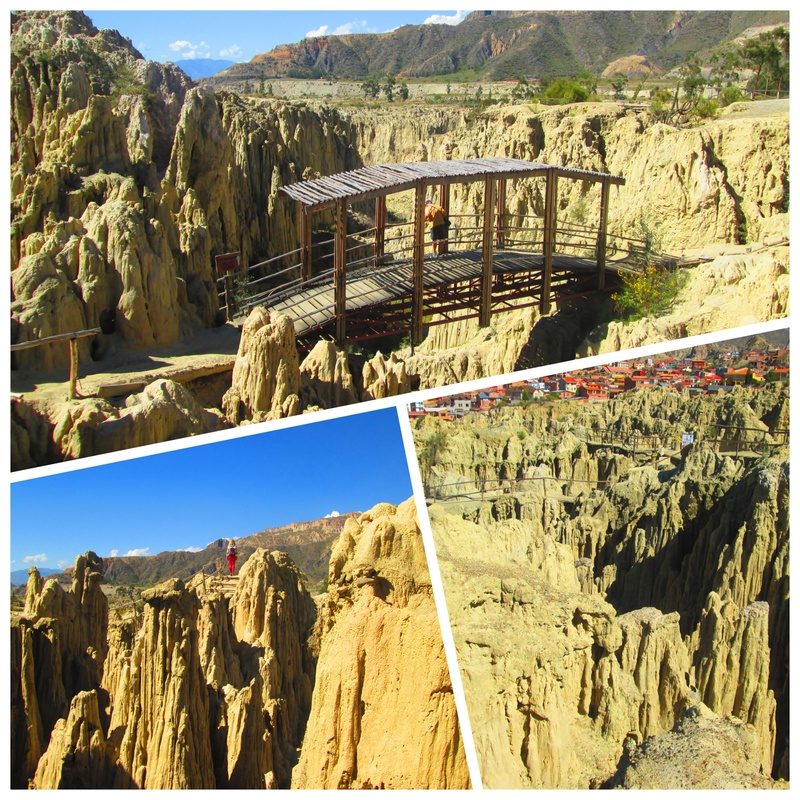 Our last day in La Paz, we took a short cab ride from Calacota to the Valle de la Luna, the valley of the moon. The mountains here have eroded into eerily gothic spires which reminds one of…the moon. Of course, Sean took exception with this..stating that the real moon is actually flat with craters. Ha, La Paz, trying to pull a fast one on this kid. This is our perch in Copacabana, Bolivia. Kyle sits in a hammock, sketching furniture. I am reading a treasure of a used book find, Barbara Kingsolver’s The Poisonwood Bible. Considering I traded an awful Robert B. Parker mystery for it, I scored big. While enjoying this beautiful view, we can’t breathe in too deeply because a family of pigs is directly below us. In addition to their smell is a constant chorus of contented grunting, which is rather meditative. 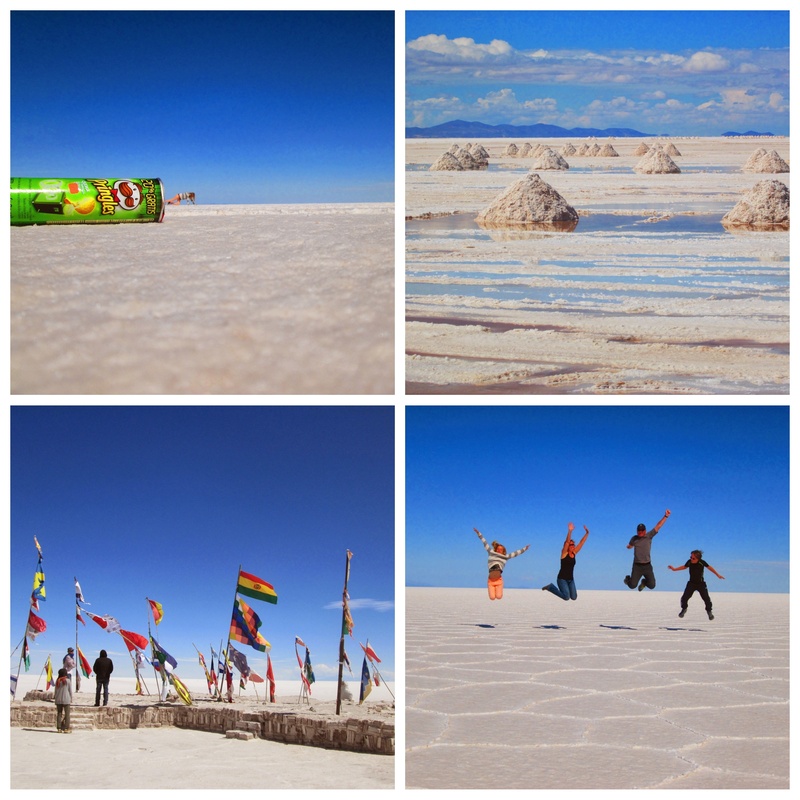 Bolivia has been a surprise. 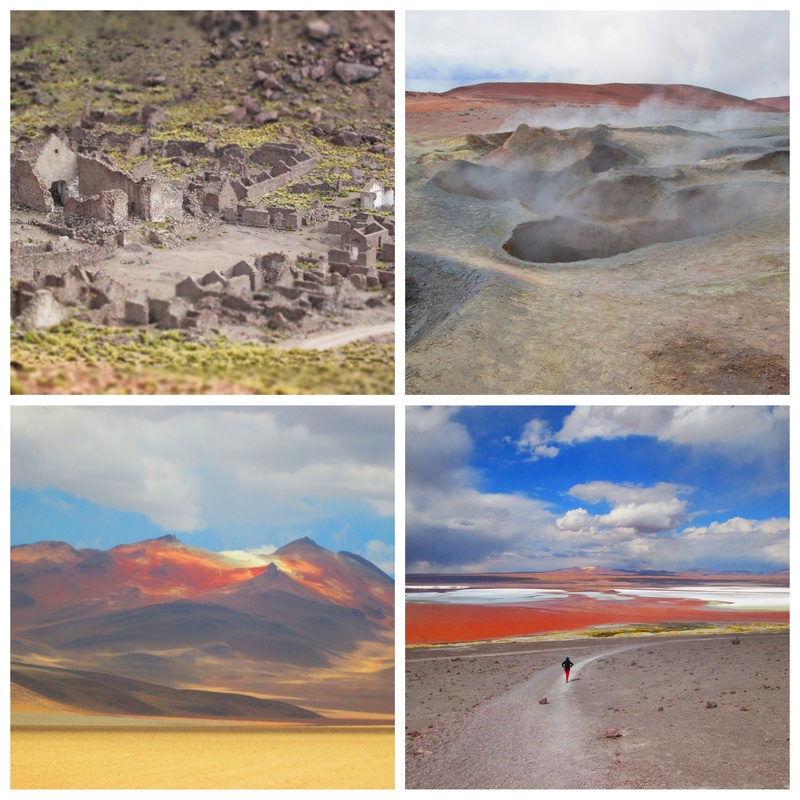 After Argentina, it was hard to imagine the natural beauty that awaited us here. I believe I’ve been on another planet these past two weeks. I’m behind on posts. I should share our views on Salta and northern Argentina, but I want to be in the moment and that is here in Copacabana. 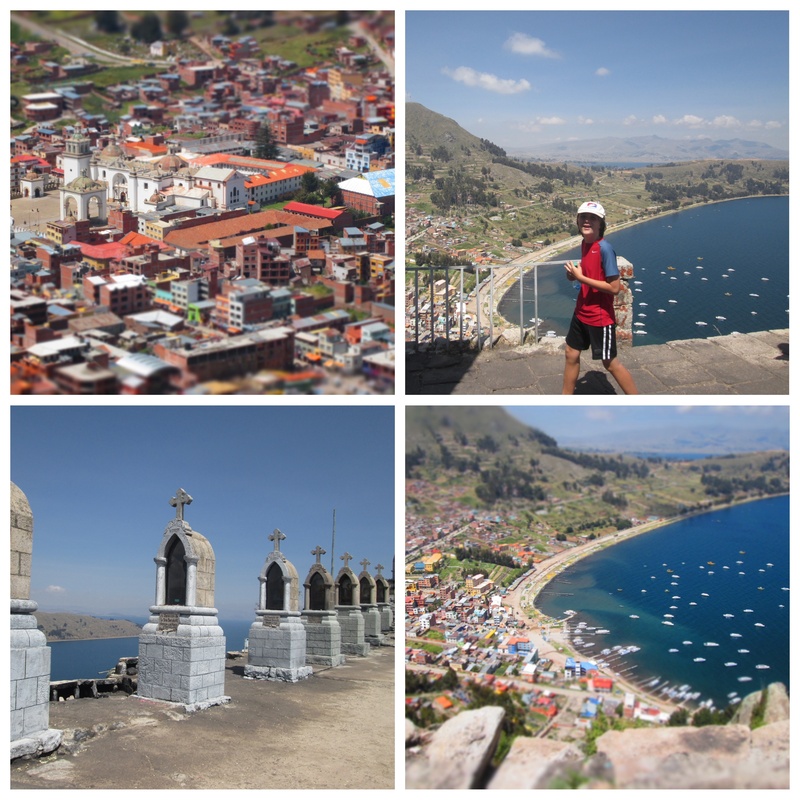 A four hour bus ride from La Paz, on Lake Titicaca, it’s a small town with an amazingly large 1640 Spanish Basilica. 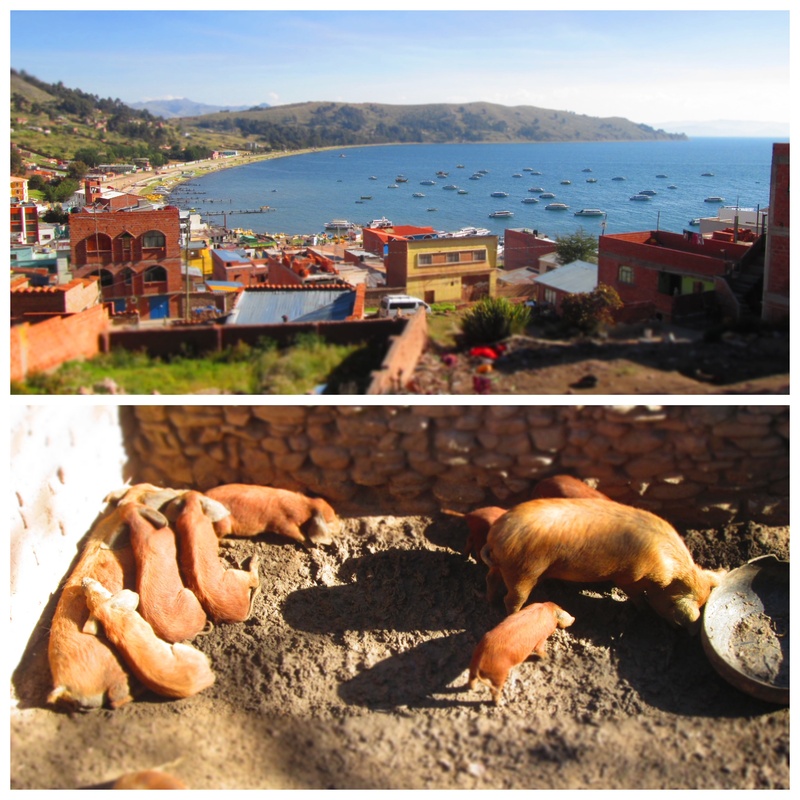 The town has given way to tourism, with hostels on every corner, tourism outfitters all variations on the name Titicaca, and restaurants boasting things gringos like….hamburgers, nachos, vegetarian food. 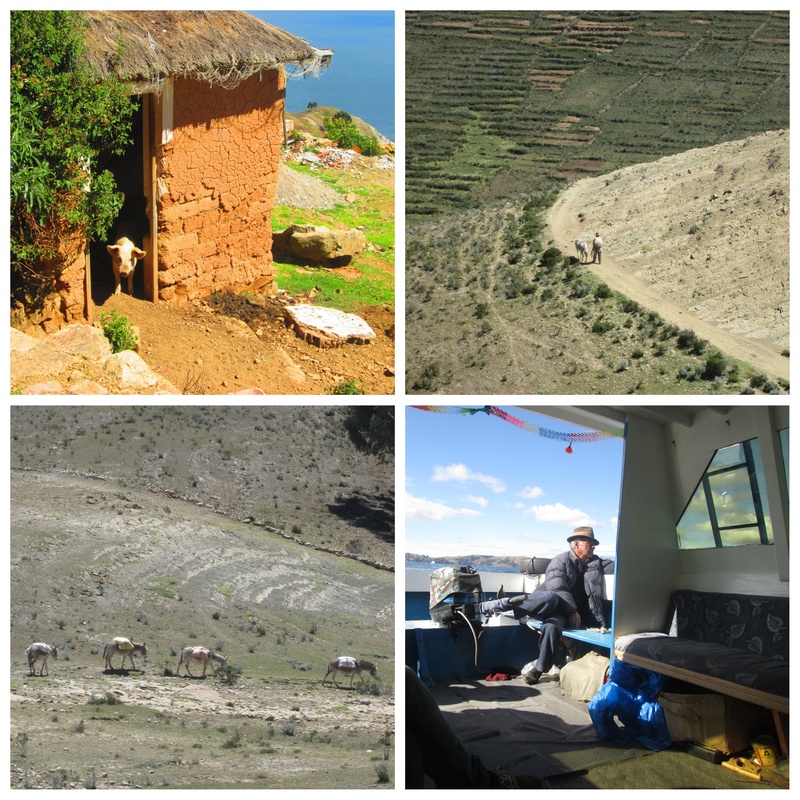 Yesterday we, and every other tourist here, boarded small boats for the two hour ride to the Isla Del Sol, an island of Inca history. We paid $25 Bolivianos (US$3.50) per family member, even though I was sure I’d just heard the boat captain charge the people in front of us $20BS. 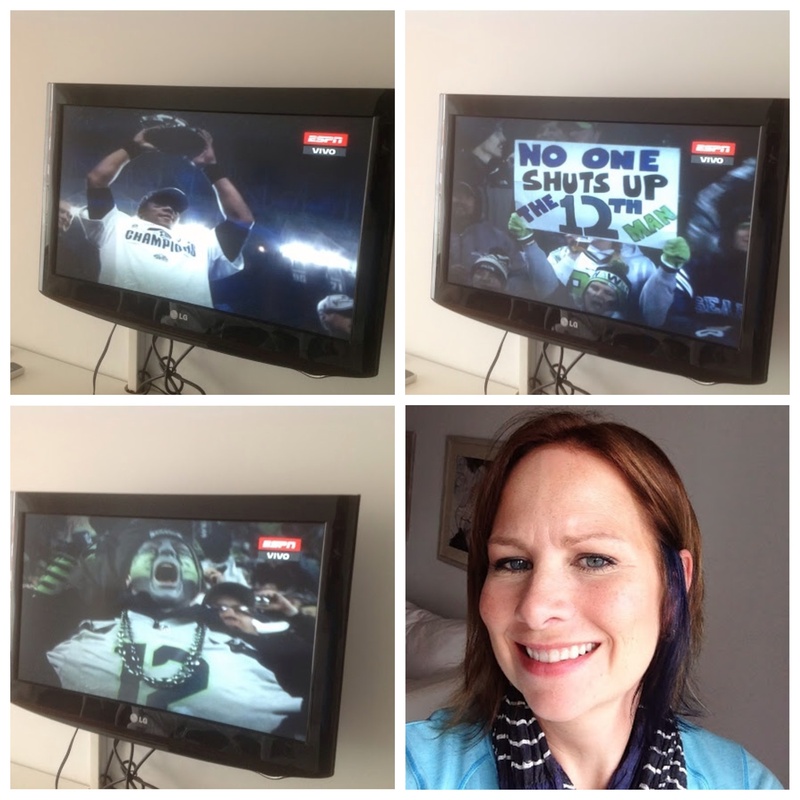 I asked twice and then let it go…maybe my Roche Harbor baseball cap exuded wealth. Upon disembarking at Isla Del Sol, local tour guides stopped each group to give them rules of the island and try to secure that group to guide. We are perpetual loners and escaped on our own. I had read of multiple entrance fees for trail upkeep and indeed there were three along the way. I expected the first $10BS and then the $15BS, but by the time I got to the $5BS check point, I felt a bit used. I had to remind myself, it’s US$4.00 at the end of the day and the hike was truly stunning. This was our first high altitude hike, an easy 4 hour meander if not for it being at 12,600 feet. So while our hearts beat loudly, we took in a landscape that seemed reminiscent of the Mediterranean. 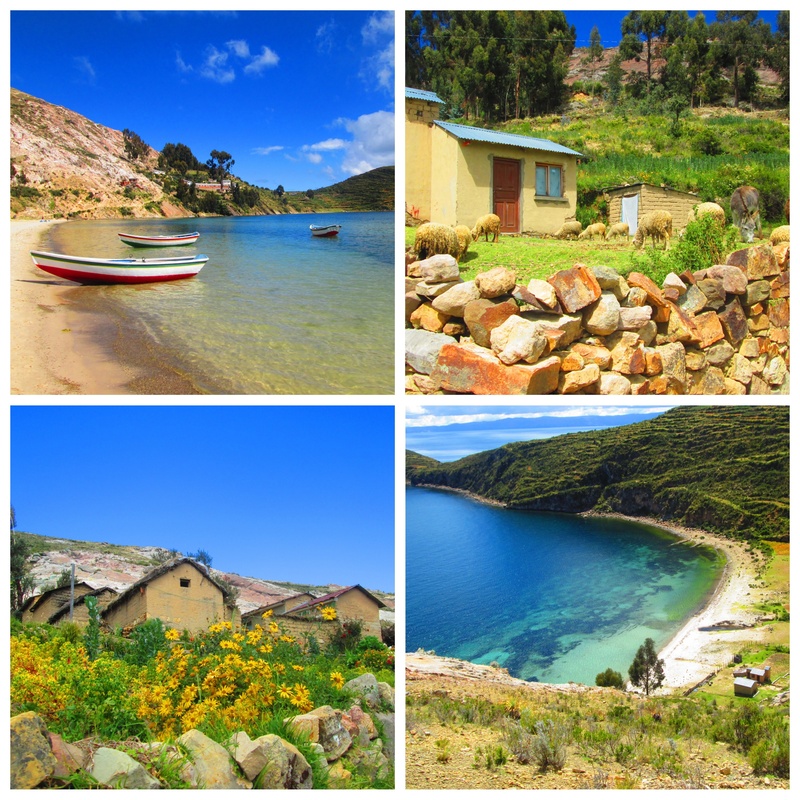 Rocky paths, wild flowers, the occasional sheep and the never ending Lake Titicaca stunned. The Inca ruins were fun to see but not spectacular. 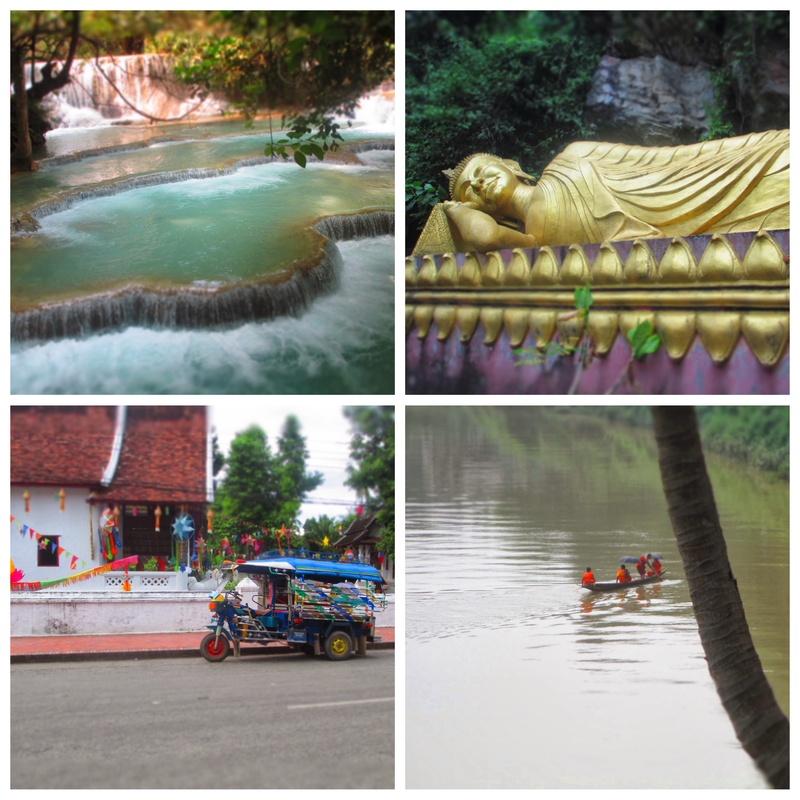 It was the natural scenery that took our breath away. When we reached the south end of the island, it was more built up with hostels, restaurants and amazing perches above endless views. I could see spending a night here simply sipping a beverage while never tiring of the vista. The backpackers were endless and some of them I absolutely love but you’d have to find the “fanciest” accommodations of the island to avoid smoke and noise…unless that’s what you’re seeking! Returning by boat there’s a 3:30PM and a 4:00PM for $20BS, all of which make a brief stop at the ruins on the south end of the island and then take an hour to reach Copacabana. It was a beautiful day. The following day we slept in, then climbed up to the Stations of the Cross outlook behind our hotel, The Cupula, where we focused on one step in front of the other, breathing hard…would we ever get used to the altitude? I think if I could train myself to run a few miles here, I could be a great athlete when we return home. We admired the views and then decided to spend the rest of the day perched above Copacabana, good book in hand, listening to a choir of pigs make their music. The Argentinian Patagonia has stood out as one of our favorite places in this wide and wonderful world. It’s hard to communicate the vastness of the space here where the horizon seems endless. Perhaps it’s the miles and miles of scrubland that make the imagery of Cerro Fitzroy and the Perito Moreno Glacier so shockingly beautiful to the eye. Perhaps it was the geographic commonality to our home state of Washington…where vast desert turns green at the Cascade mountain range and lakes and alpine forests flourish. The wildlife here stunned us…charming penguins and dolphins, graceful rheas and cuarnacos, tough condors, stock still flamingos, rhythmic red headed woodpeckers and on and on. Even animals common to us, such as horses, look more romantic being ridden by a gaucho in this wind swept land. 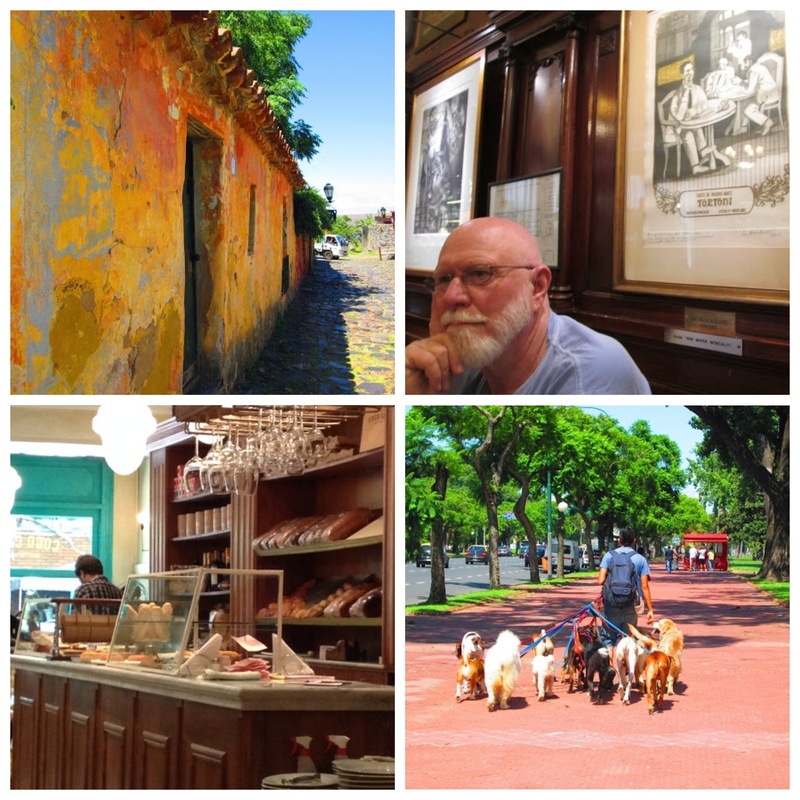 The chaos of Buenos Aires is so far away…the people here seem more rugged, low key and creative in the way that small town enterprise (or lack thereof) forces you to be. We have never in our trip heard more American accents…we are surrounded by baby boomers wearing North Face and Patagonia on REI tours. On a particularly windy and rainy day in El Chalten, we hunker down in the warmth of our hostel and I watch gray hairs with packs bigger than mine headed out to tackle a 12km trek…they are a tough generation! 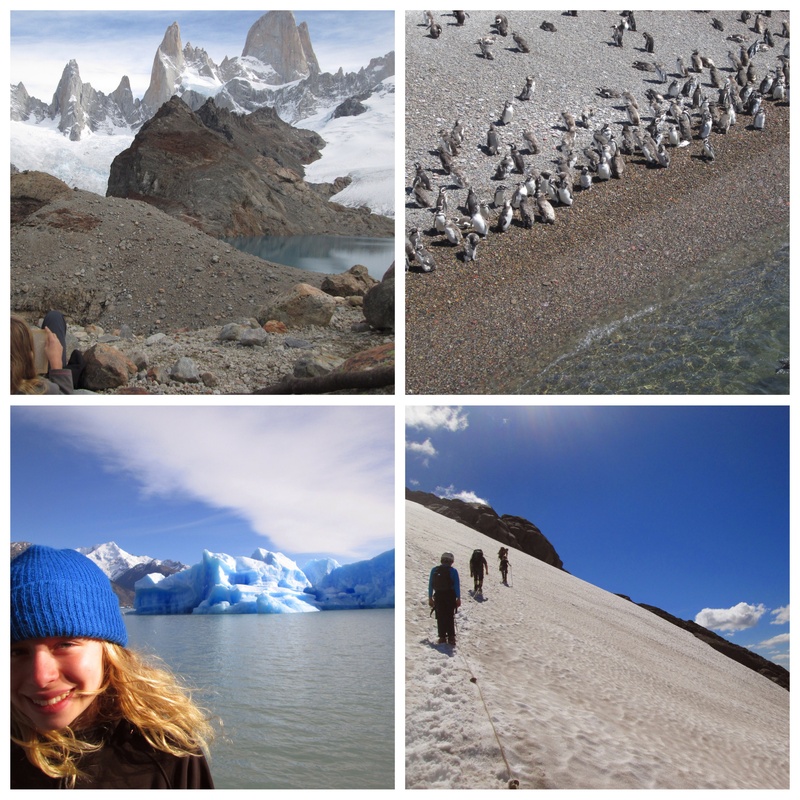 By the time we leave El Chalten and El Calafate, we’ve trekked to Fitzroy and Torres, witnessed glaciers calving, and watched icebergs float by. We’ve been close to the end of the continent and are grateful we ended up spending two weeks here. And I know we’ll be back. 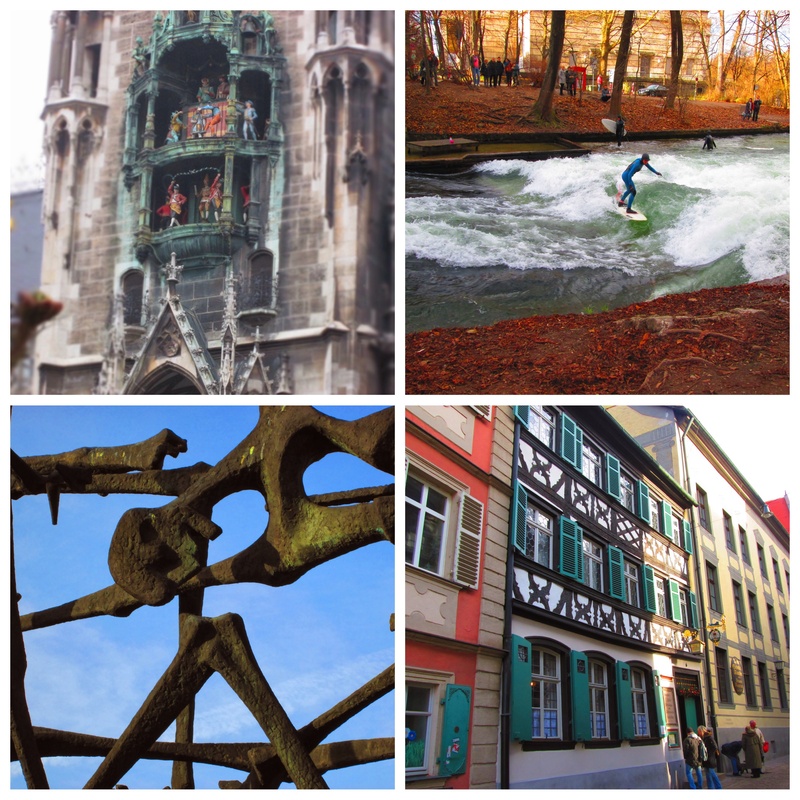 With the high numbers of young backpackers and older gringos, Europeans and Japanese that flock to this area, there are plenty of lodging options at all levels. 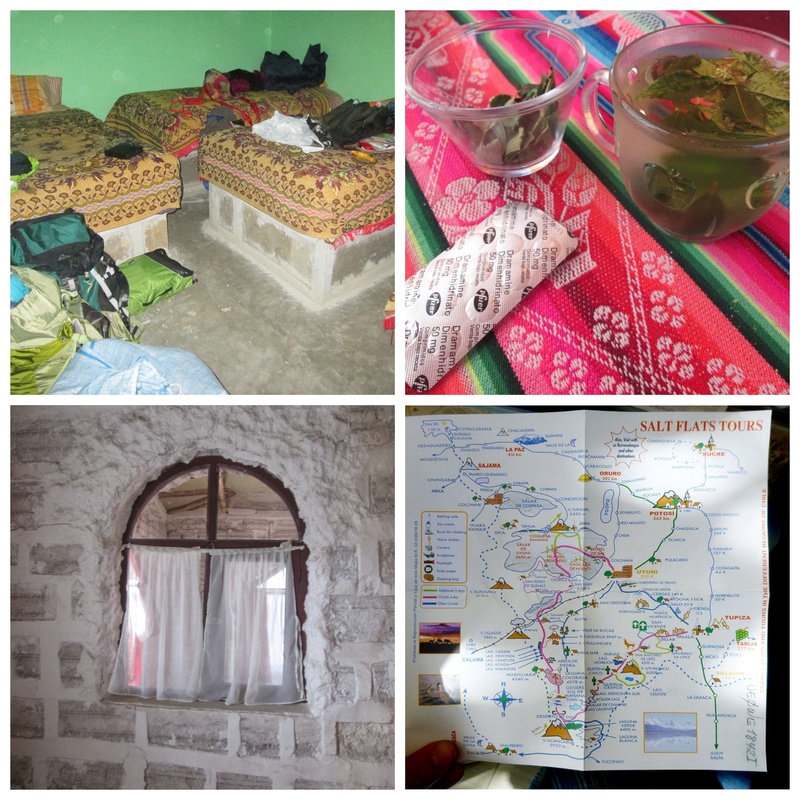 In El Chalten, we stayed at a hostel with private bathrooms, El Alamo. Quirky as always with pillowcases smaller than the pillows and doors that don’t quite close, for the price of $50/nt and friendly hosts, it did us fine. In El Calafate, we stayed at Las Avutardas Hosteria. Roughly $70/nt for a small apartment. 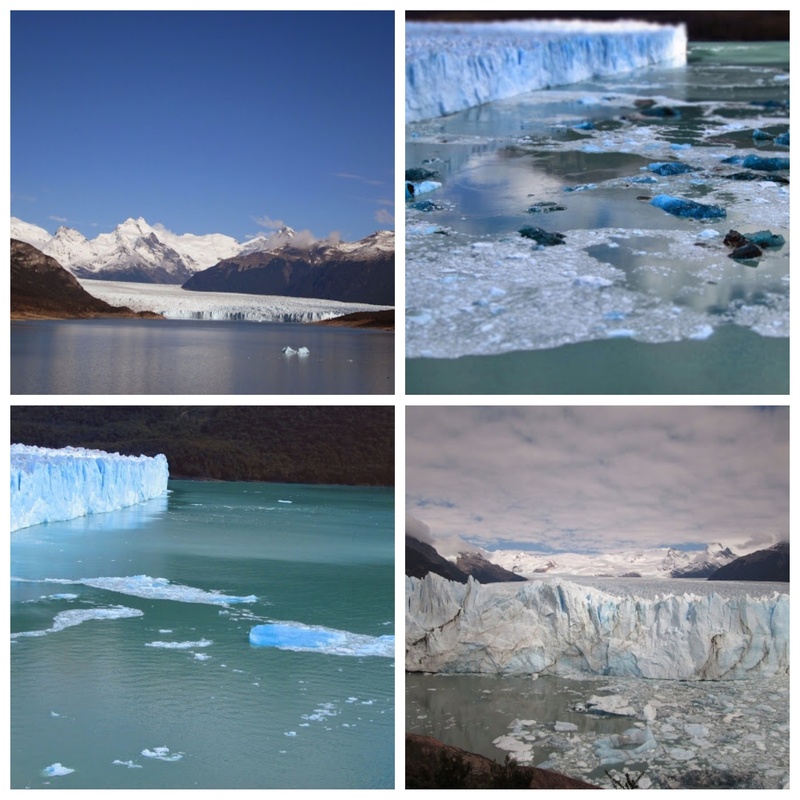 While the lodging wasn’t anything special, the owner was very helpful and took us to Perito Moreno for the same price as a big bus tour…it was nice to set our own schedule. We rewarded the kids with a trip to the Waffleria after a long hike…we had savory, they had sweet and we all raved about our meal. The most popular La Tapera had wonderfully friendly service and a warm atmosphere but the food was so so. We discovered La Vinerea on our last evening in El Chalten, with a wide selection of beers and wines and good eats. 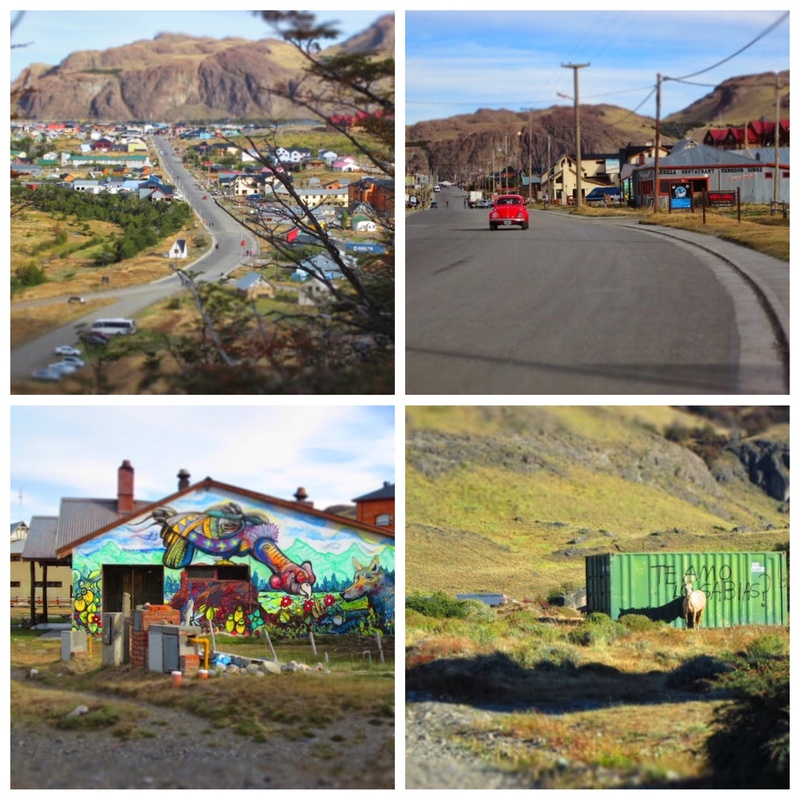 We experienced little good food in El Calafate but found the Chopen Cerverceria, which was a block from our lodging, to be better than the TA reviews gave it credit for. This is a no brainer. 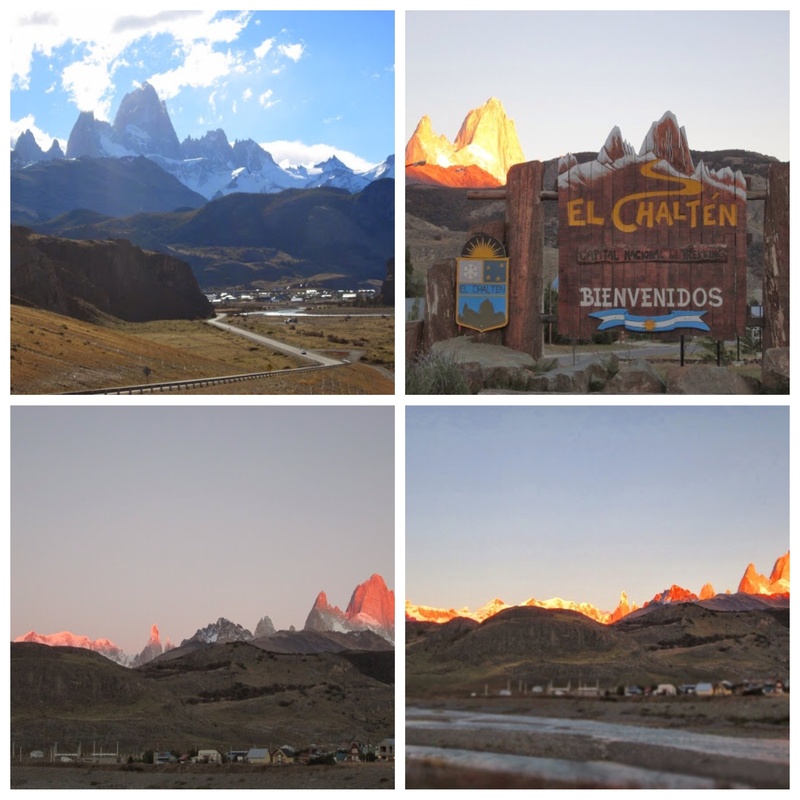 Stay four nights in El Chalten…this gives you two days of hiking and one rest day. Weather is unpredictable so it also allows time to see the beautiful Fitzroy on a clear day. 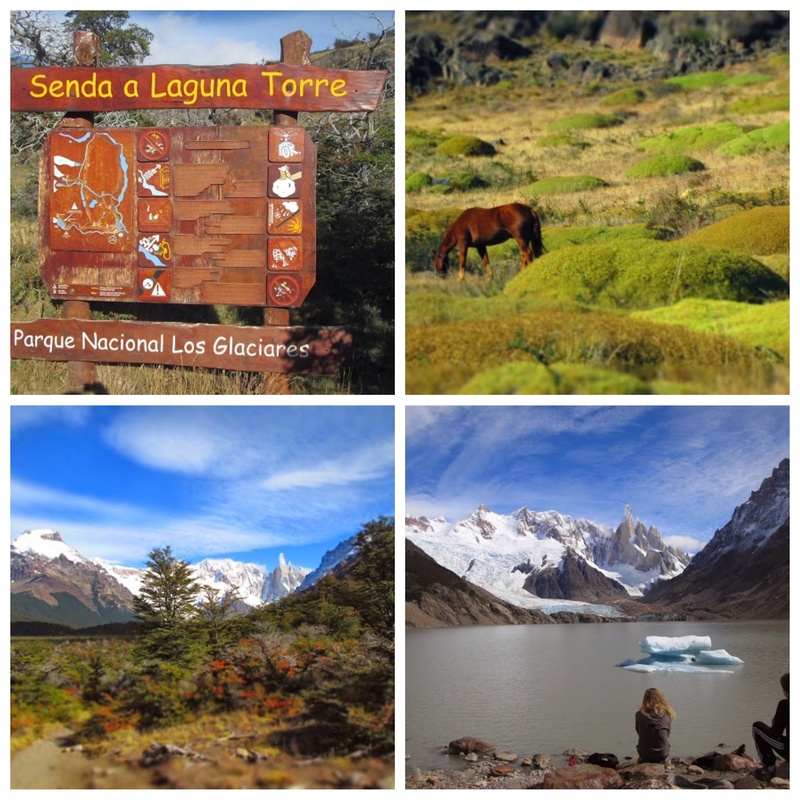 The Laguna Tres hike is the tougher of the two, so do it first, rest a day, then do the Laguna Torres. Stunning. Stay three nights in El Calafate. Hire a private car to take you to Perito Moreno and spend hours meandering the wood walkways listening do and watching the glacier move. We found the boat ride to Perito Moreno a dud…it was expensive, packed and all about photo ops with a professional photographer on board…not our thing. Spend an afternoon at the Glacierarium and visit the ice bar. We didn’t and the kids keep reminding me of that daily. 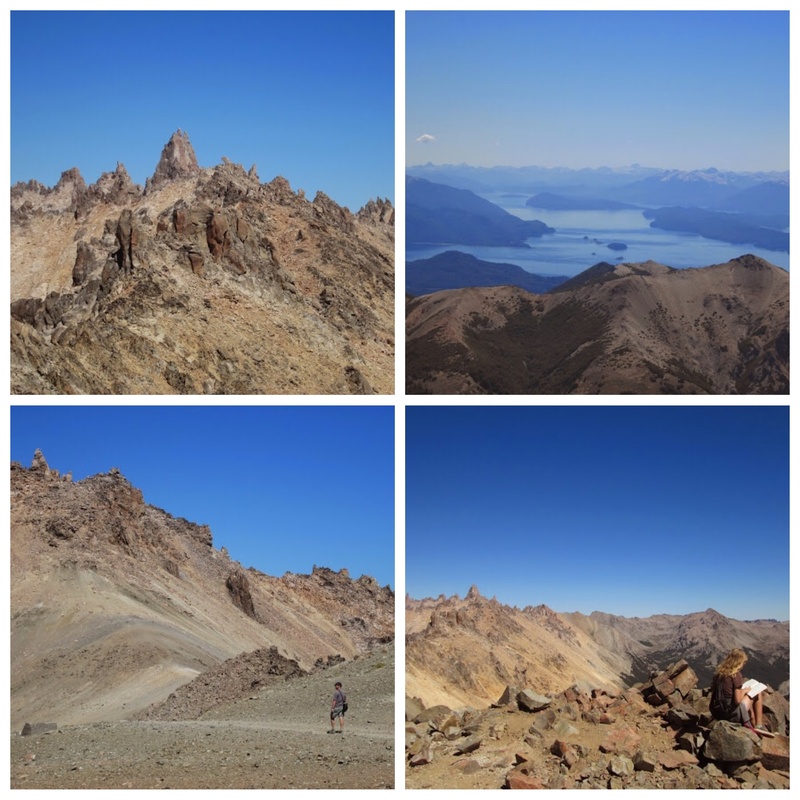 Bariloche hooked us with the number of scenic hikes it offered. 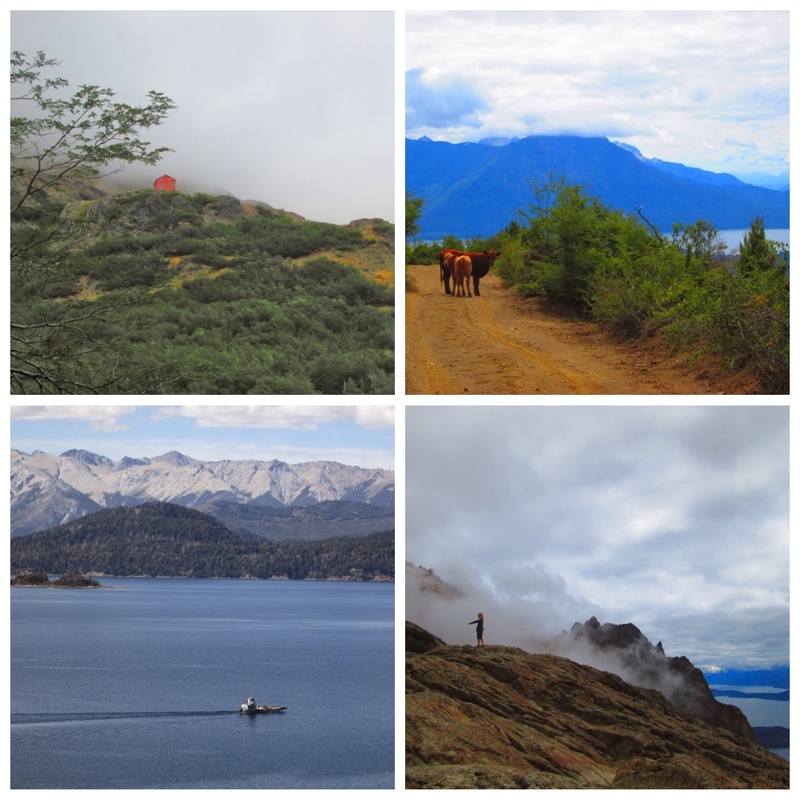 The diverse Nahuel Huapi National Park is its doorstep and oh boy did we partake. Campanario was fun but easy and too much in the tourist path (perhaps it was the multitude of tour buses at the entrance?) but it gave us a taste of the beautiful views to be had…islands, lakes, mountains…mind blowing beauty. So next, we decided to try our hand at Cerro Lopez, a 12km trek, the goal of which was the Refugio Lopez. 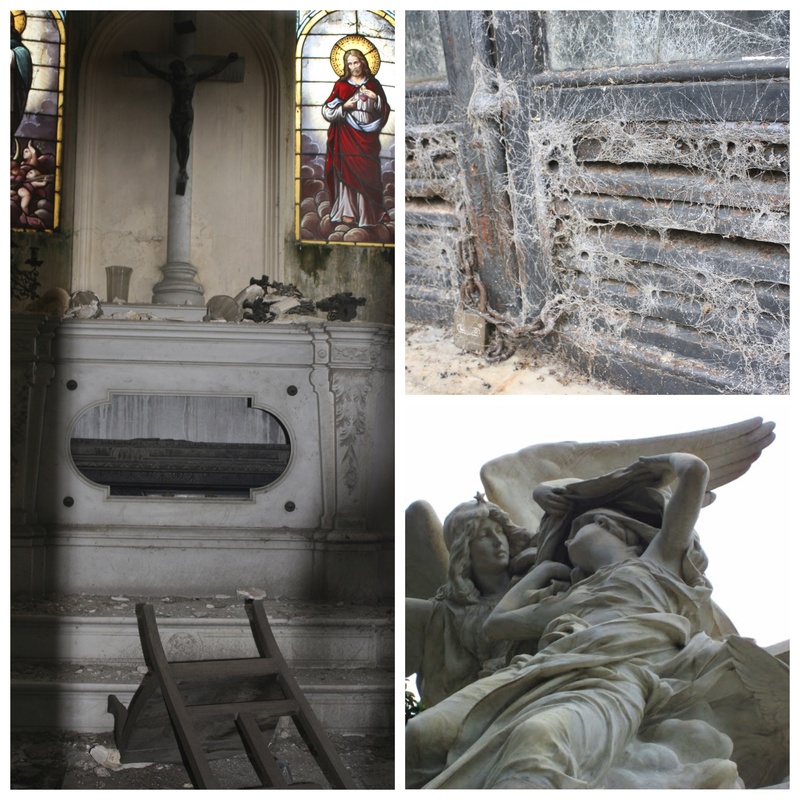 Refugios are as they sound…refuge from the elements. The Lakes Region has a wonderful network of refugios so that you can hike from locale to locale without camping equipment and end your hike with a glass of Malbec…so civilized. One thing Bariloche has in spades is dust…each day we come home, whether hiking or not, it covers our shoes, socks and shins. The trail to Lopez provided dust by the fistful, billowing out with each step to greet the person next in line. The trail is not well marked and we were fortunate to have Sean’s keen directional sense to lead us correctly up. When we at last reached the refugio, we were rewarded with stunning views and sweeping condors. At one point, Kyle and I sat taking in the view and two condors flew right in front of us…my mouth was agape…my camera in hand but no ability to respond, I was so astounded by their size. 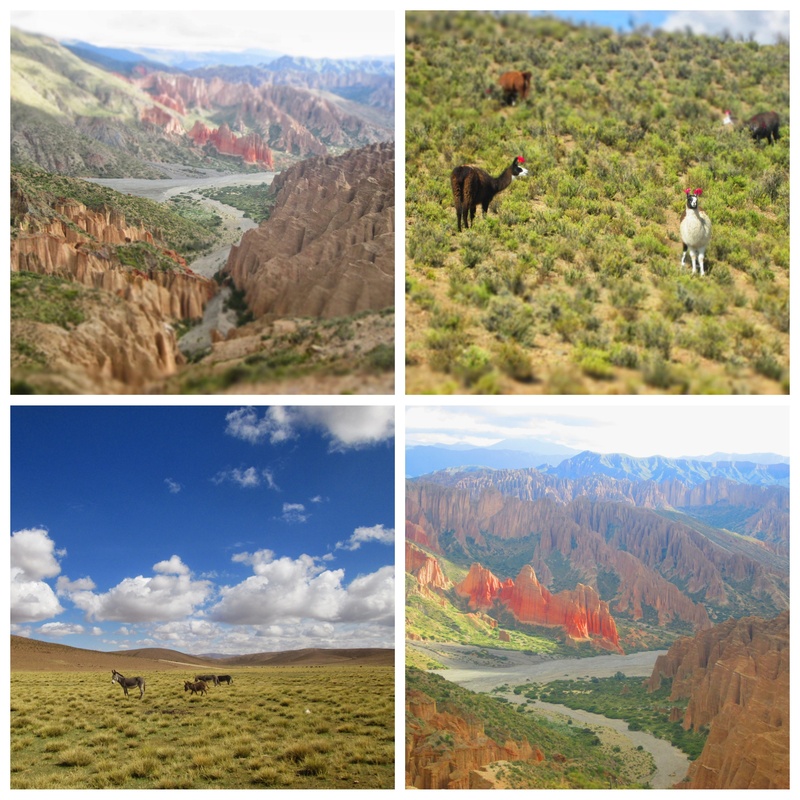 After Lopez, we were ready for a multi day trek and consulted the ever helpful Club Andino for an itinerary. And thus we found ourselves one early morning taking a minibus to Pampa Linda to commence our three day trek. Pampa Linda sits at the base of Mount Tronador two hours south of Bariloche. 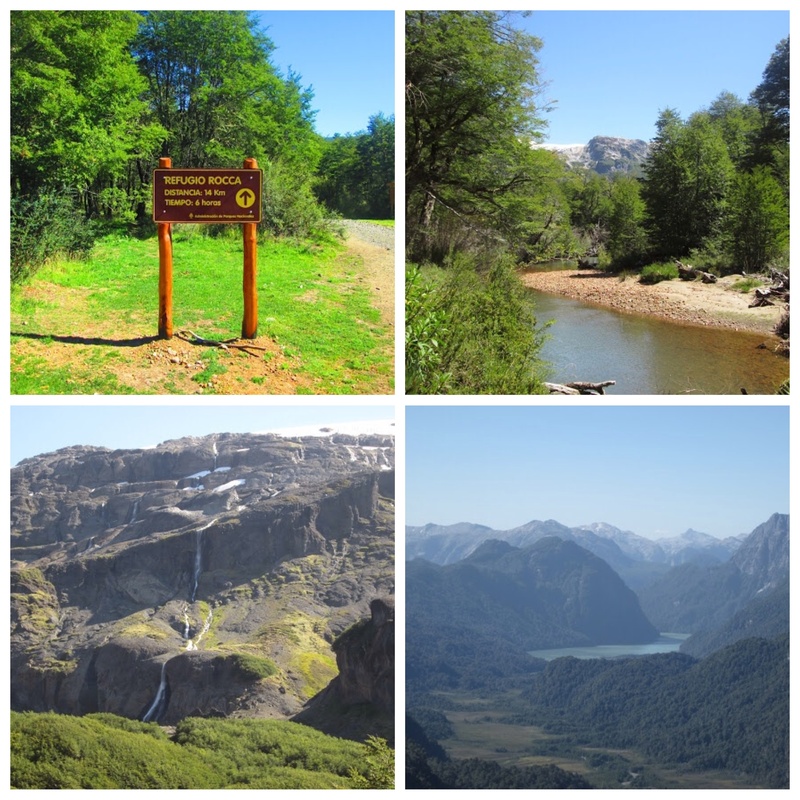 A popular hike is up to the Otto Meiling refugio, which sits dramatically at the edge of the Castaño Overa glacier. It’s common to cross the glacier to the Rocca refugio, then hike into a valley to Lago Frias, where you can ferry and bus it back to Bariloche. 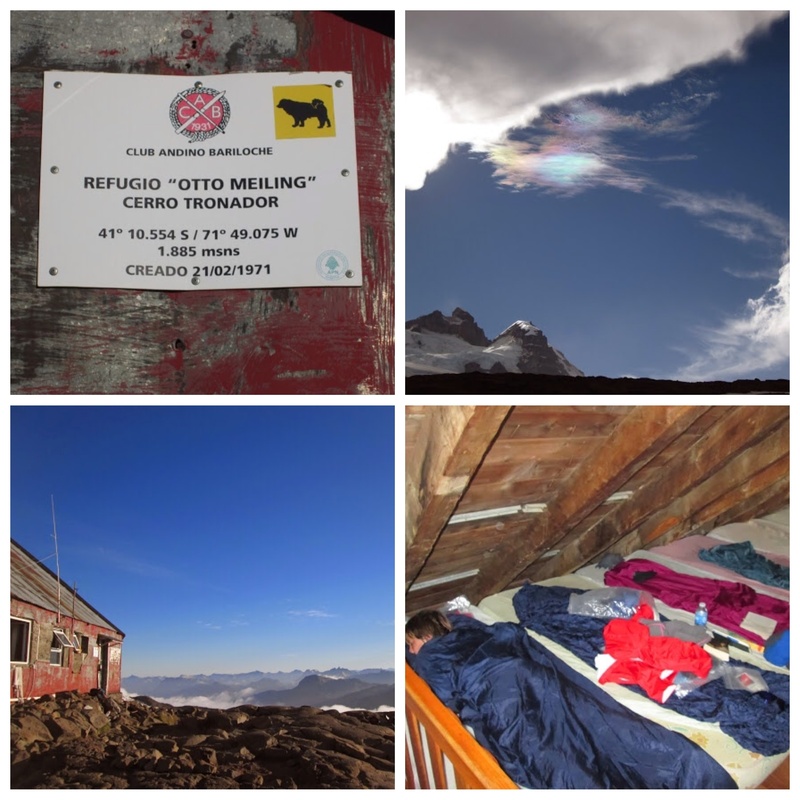 We were hitting Otto Meiling in reverse, a 14km hike to Paso de Las Nubes to stay at the Roca refugio, then crossing the glacier with a guide to the Otto Meiling refugio, and down along the Otto hike the last day. The hike up follows a river and Patagonian trees, bamboo and rocks surround the path. A warm pine aroma and the sun shining down accompanied every step. This was the first hike in a long time with full packs and the last push was brutal…both amazed at what my body is capable of and shaming myself to be stronger. At the top we were rewarded with the view of a lush valley, 15+ waterfalls cascading down the rock around us, and condors playing above the cliffs. The hostel itself is new and spacious with an inviting common area and, as it was nearing the end of the season, we were lucky to have a room of bunk beds to ourselves. It was at this lovely contemplative place that I realized we were peso-poor. Here’s the thing about pesos…the common bill is $100 (roughly equivalent to US$12), so US$200 feels like an enormous amount of money when converted to pesos. 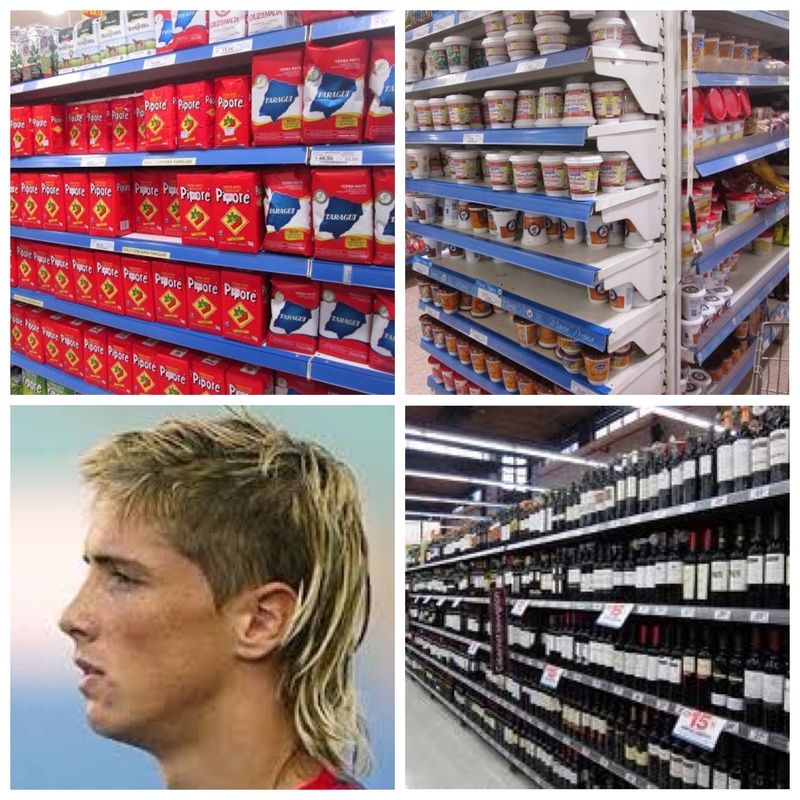 But all things in Argentina are expensive and the money quickly goes. I meekly returned the sleeping bags we rented to the hostel manager…we couldn’t afford them if we were to eat after our long hike! No Malbec that night! The next morning we met our guide for our first glacier crossing. We started with a two hour hike up to the glacier with our refugio getting smaller and smaller behind us. Just as we were about to gear up, we noticed a juvenile condor perched just 10 feet away! 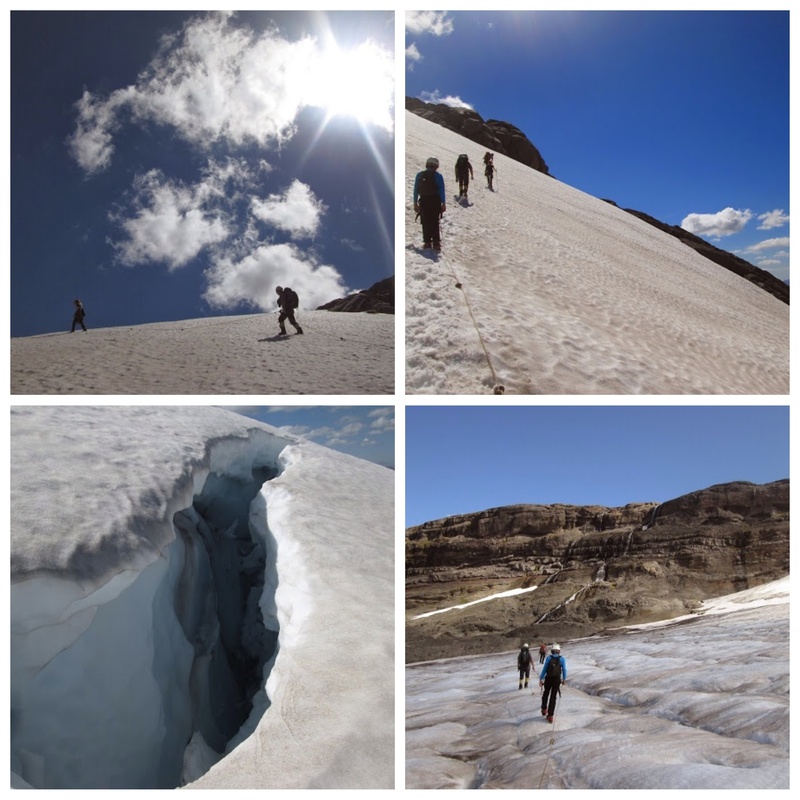 The glacier crossing seemed to be a beginners trek…hard to know what deep crevasses we missed by an inch but from a novice’s view point, it seemed an easy trek. The views were beautiful and I tried to capture photos while also ensuring I didn’t step in a crevasse. We crossed quickly and removed the crampons, ropes, etc to finish the hike to Otto Meiling. 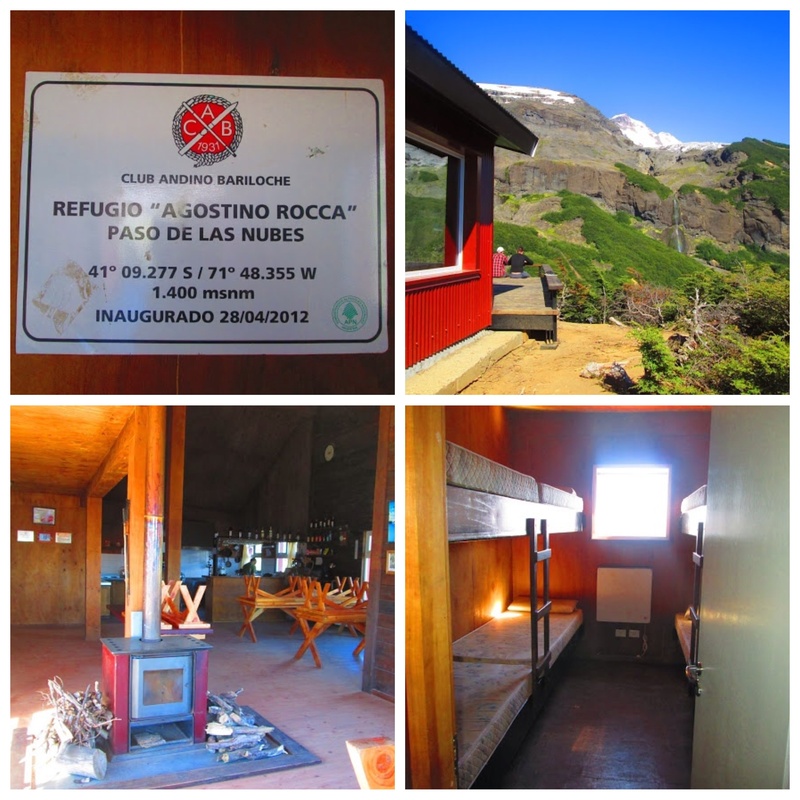 The popular refugio owes to its setting…dramatically sitting at the glacier edge with layers of mountain peaks in all other directions. If the wind wasn’t blowing so hard, you’d sit on a rock peak admiring the views. But the cold quickly forces you inside the refugio, a small, cozy place. Sleeping quarters are simply one big room…you grab a mattress, find a space and hope that there aren’t too many snorers in the place that night (there were!). The refugio graciously let us settle with them post hike so we were able to end our day with a bottle of Malbec and filet mignon with sautéed mushrooms…heaven. The accommodations may be simple but the food is gourmet! Despite the sleeping arrangement, we were lucky to share the space with only eight other hikers. The capacity is for 40 and I’ve heard they’ll pack in more…that’s a lot of post-hiking-stinky bodies in a small space. The hike down the next morning was uneventful…not as gorgeous as the path we took up. We were thrilled to reach the bottom and lay in the grass of Pampa Linda awaiting the bus back to Bariloche. 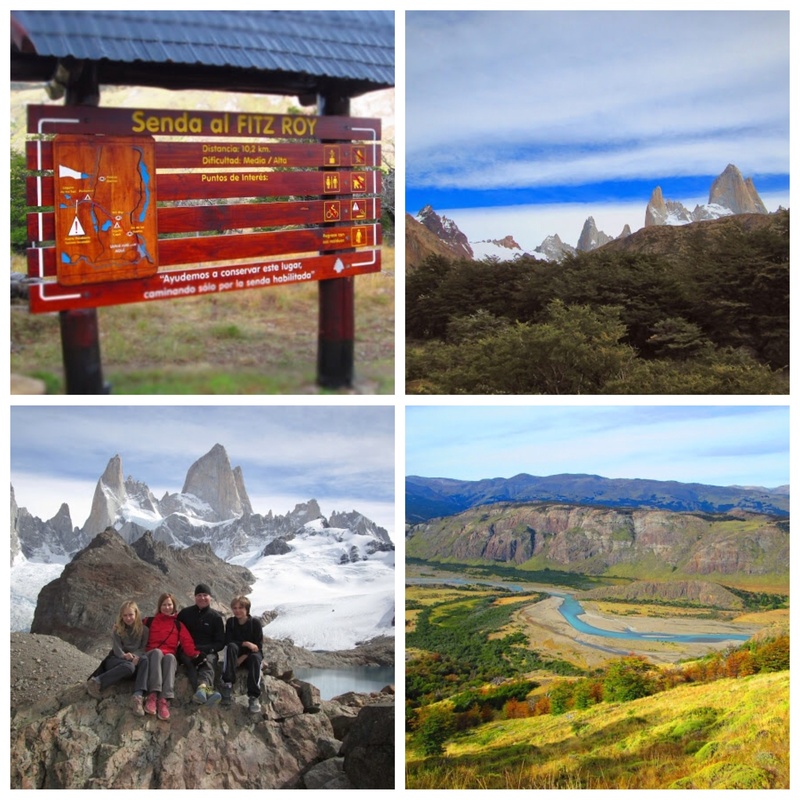 I highly recommend this hike…it makes my list of top ten experiences on this trip. 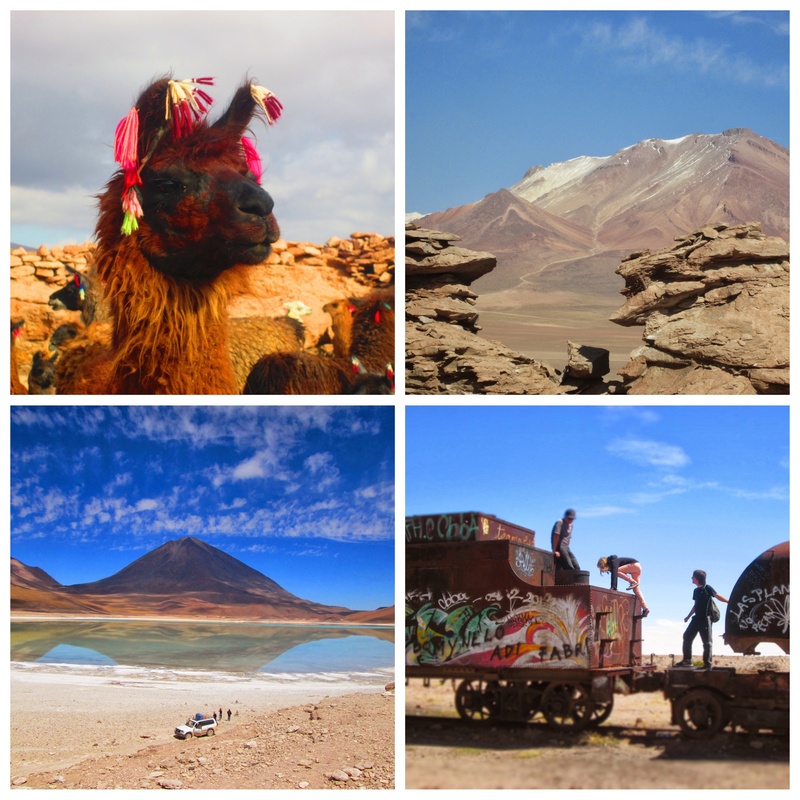 Lastly, an easy day trip is Cerro Catedral. You take a gondola and then chairlift up and then hike the last 30-45 minutes to a spectacular lookout. On one side you see Bariloche and the lakes, on the other peaks that look like they’d be on Mars and an enticing mountain valley. From here you can hike to refugio Frey. For us, this was an easy day trip, one benefit of which was that the 3G of my Argentinian cellphone plan purchased weeks earlier in Buenos Aires finally kicked in on my iPhone! It’d been stubbornly absent since purchase. Perhaps all I needed was to get a little bit higher to a satellite that day to nudge it on. Our arrival in Bariloche started off with a hitch. But first, our second overnight bus ride. Best seats on the bus? Entering El Bolson valley. We were awoken at 6AM by a national guard soldier standing beside me with a gun yelling for everyone to get out their documents. In Rachel paranoid fashion, I had wrapped my backpack straps around my legs so it could not be taken while I slept and now struggled, half asleep and startled to find our passports. All well though and we continued as we watched another stunning sunrise. Kyle and I grinned at each other as the mountains grew bigger, the trees grew greener and lakes appeared…coming from Seattle this felt like home. 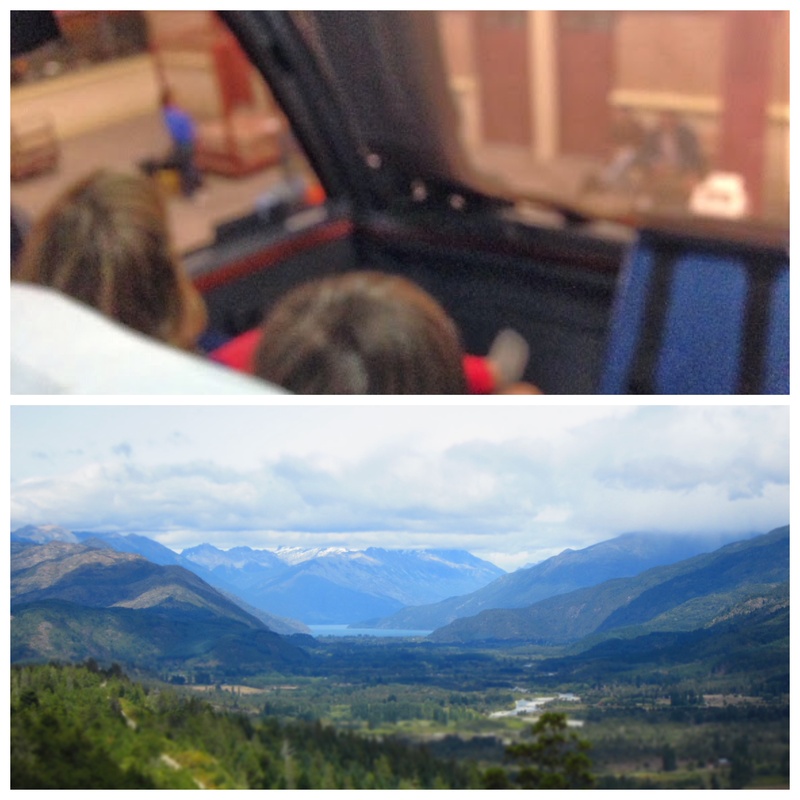 We were headed to Bariloche for a week, we would end up staying a month. I had booked a small apartment for a week on Airbnb. I found a pay phone at the bus station and called the rental agent, who sounded genuinely confused to hear from me. We quickly realized we were expecting each other on different dates and, darn it, he was correct. Don’t you hate that? As I scrambled on the phone, I thought of my tired, cranky family waiting for me with the backpacks and how I was going to tell them we actually didn’t have a place to sleep after an overnight bus ride. Whoops! Ashley though is a property manager extraordinaire and he told me to take a taxi to the Holly Cafe, get breakfast for the family, log into the free wifi and wait for his recommendations of hotels with availability. Many travelers simply arrive without reservations and walk from location to location seeking the best room for the best price. This is not my family. Maybe Kyle and I could work up the courage for more serendipitous moments on our own but with two kids in tow, I like knowing where we will rest our heads. Holly Cafe is at the waterfront south edge of the town center and we enjoyed a rare excellent cup of coffee while taking in the incredible views. Light blue sunny skies reflecting down on smooth darker blue water surrounded by mountains which evolve from grey slate to tree covered green as your eye scans from north to south. Stunning. We spent the night at Alun apartment-hotel, definitely out of our budget but it was walking distance from our next abode, both about 6kms along the main drag Bustillo. In retrospect, we should have gone for a cheap abode in the center so we could visit the tourist information center and the holy grail of all trekking info, Andino. Oh well. The next day we checked into our apartment for the next week…it was a tiny affair with a marvelous view conveniently located above a restaurant, vegetable/fruit store, meat store and general store. What else do you need? Bariloche has a downtown that travel guides refer to as the “Switzerland of the Andes.” It’s nothing of the sort. 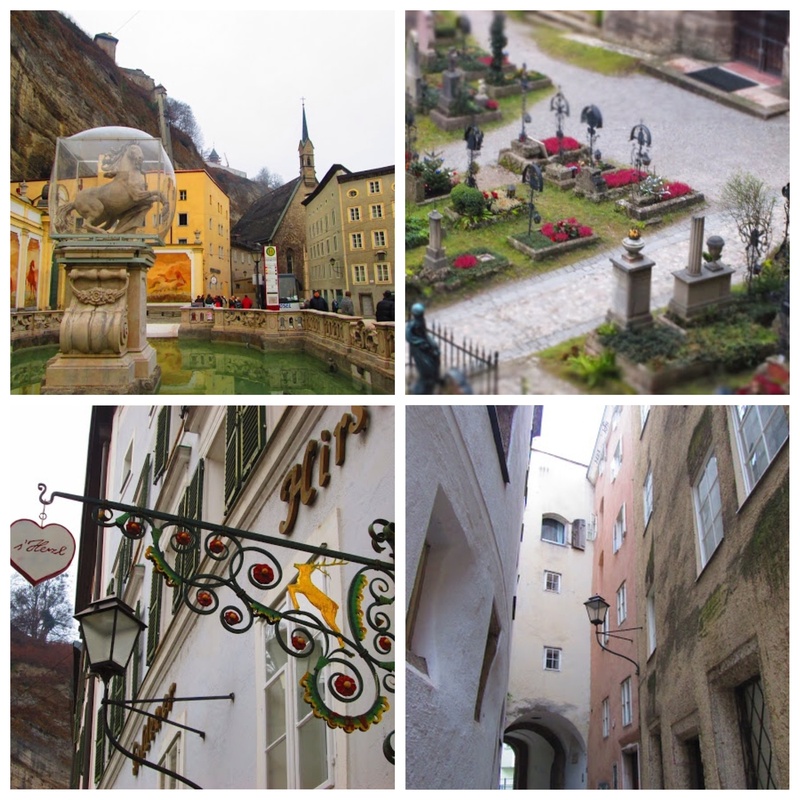 There are amazing views, an abundance of chocolate shops, and yes, 1-2 St. Barnard dogs in the town square ready for photo ops, but that’s it. 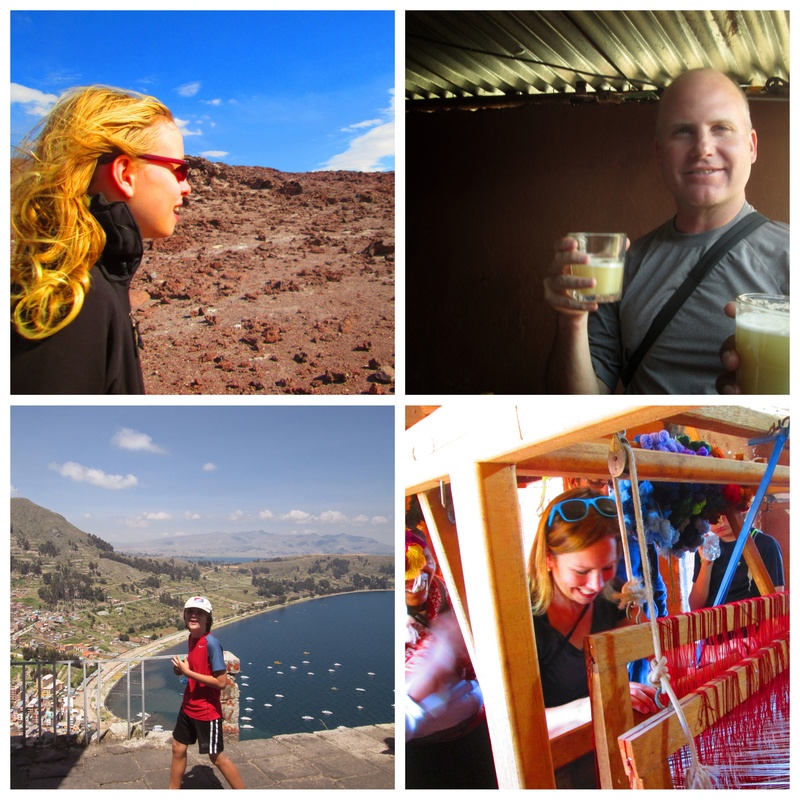 It’s a hodge podge of tourist shops, kioskos, and ridiculously expensive outdoor wear shops. 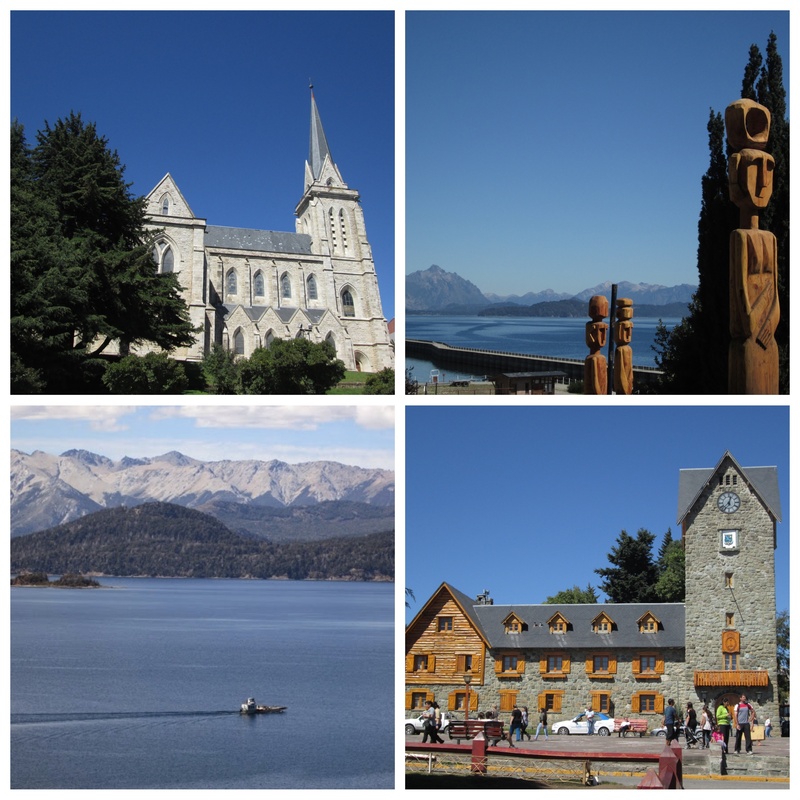 BUT, when you get out of the center….when you situate yourself close to the Llao Llao peninsula, that’s when you see the beauty of Bariloche…it’s in the seemingly endless mountains, lakes and islands. Hmm, I think we’ll stay. 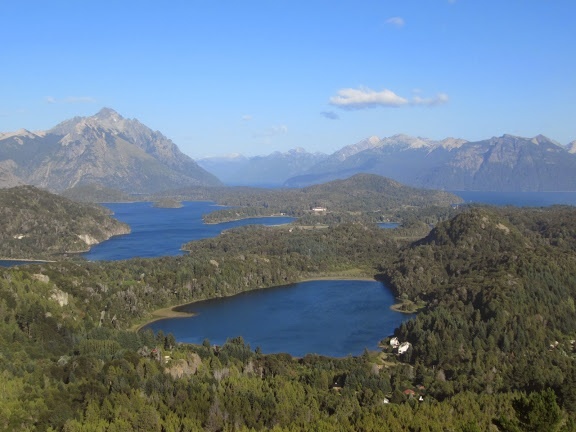 Our intention had been to head north to San Martin de Los Andes to hunker down for a few weeks but all it took was one long hike in Bariloche to decide to rent a home for an additional three weeks and hunker down. “My parents taught me many things: the importance of family, humor and resiliency, independence and hard work. Did I say family? Travel was not something my family did. Family vacations were not in the cards and we never took one. Well, one summer I did go to New Bedford for a week to stay with my godparents. That was it. Home was on Cape Cod, my world was small, and I never knew what a bagel was till I went to college. Fast forward several decades and now my own children are teaching me things. At the encouragement of our daughter Rachel, my husband and I recently left the comfort and familiarity of Cape Cod to meet Rachel and her family in South America. When I first met Rachel she was eleven years old and she and 13 year old Aaron were a package deal, a bonus, that came along with her dad Bruce. Now, the Greenleys are their own wonderful package in my life and bravely experiencing varying levels of togetherness as they travel round the world. At 62 this was my first passport. My first trip to a place where I didn’t speak the language, know the culture, the history, the currency, how to order in a restaurant. So many firsts. I loved it. I chastised myself. Why hadn’t I learned Spanish! 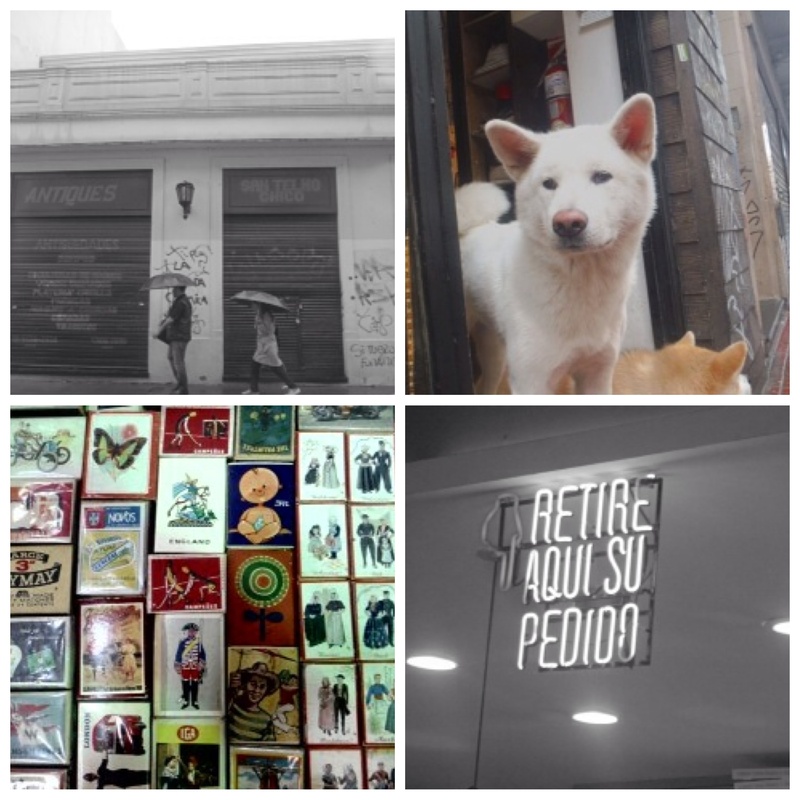 Read up more on Buenos Aires! Planned on staying longer! As I look back through the 600 plus photographs I took I realize this was just a taste. There is so much to see. So much I don’t know about. I never missed bagels till I ate my first and now they are a staple. Where should we go next? I found I was comfortable in Argentina and Uruguay. People seemed the same. They came in various sizes and shapes. Some were friendly and helpful. Some were not. My grandchildren were tall and lean and let me hug them. Well, one hugged me alot and the other tolerated a couple of hugs. We won’t name names. This trip was about the things my parents taught me…family and humor and the reward for hard work. And it was about the things my children are teaching me. Life is damn good. While we are currently in Argentina, I can’t give the shaft to Salzburg by not sharing our experience in Mozart’s birthplace. 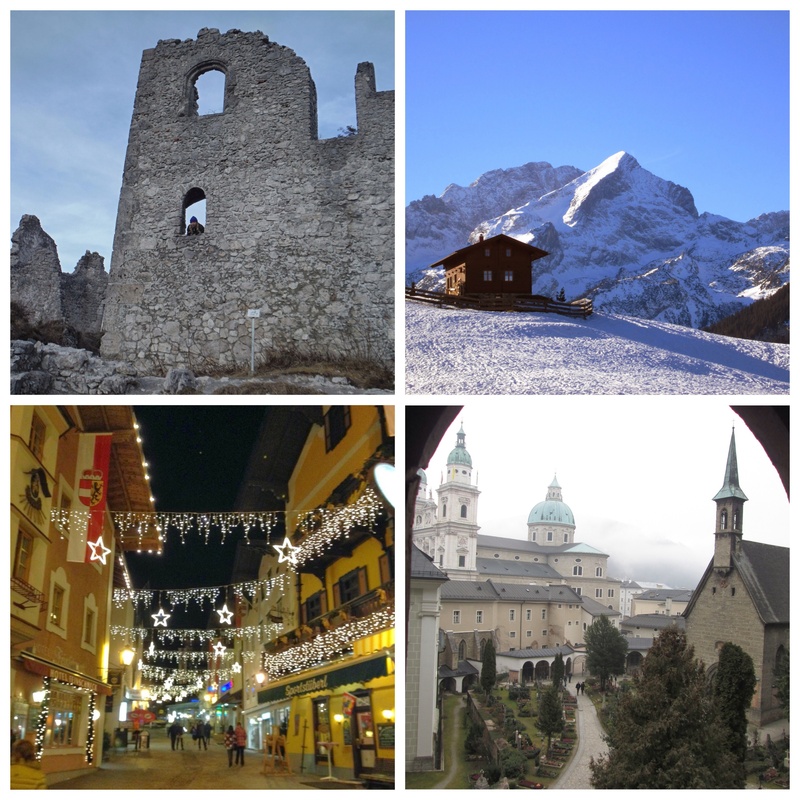 From country to city to town, we are always asking “Would we come back?” Salzburg is a resounding yes. Not only is the city our “perfect population” — 150,000 — it delivers on quaint feel with modern amenities. Visiting in January takes nerve. 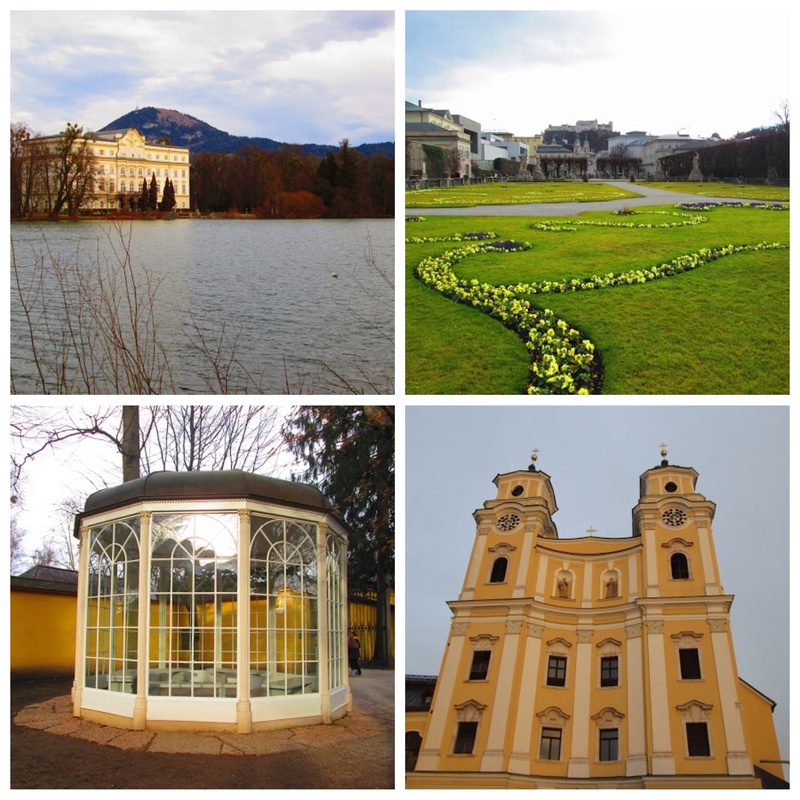 Perhaps it’s easy to join a Sound of Music tour the day of, but you’ll miss basking in the sun on wide stretches of green grass that meet up with the mountains surrounding Salzburg. There is a picnic lunch and a good book in my future, perhaps during the shoulder season. We spent a brief four nights in a wonderfully eclectic apartment built into the stone mountain on Lindergasse. Of course, the refrigerator froze our food and a mildew problem was in full effect due to a burst pipe, but that is the life with Airbnb. There’s much made of the American obsession with The Sound of Music…people will tell you haughtily that Austrians have never heard of the Von Trapp Family. Judging by the multiple two story tour buses with Julie Andrews blown up mug, I believe that time has passed. The kids and I cozied up one night to watch the movie and imagine my glee when they actually enjoyed it. We did the tour with Panorama the next day and while entertaining, it makes for a long day. I recommend only doing it with a dozen obsessed, slightly inebriated fans who will unabashedly sing all of the songs as you drive. Our group was a bit reserved, whispering the songs quietly. The Rick Steve’s walking tour was an easy way to explore the city. 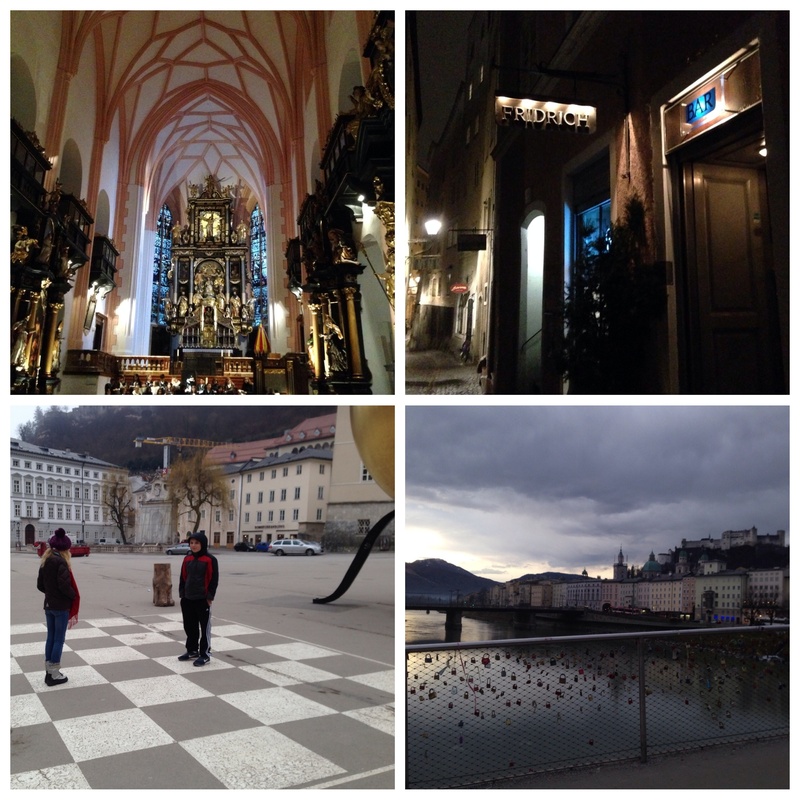 Rumor was of a thick snow and it eluded us so we could enjoy exploring the city on foot. The homage to Mozart is everywhere, understandably. There are numerous free concerts throughout the city, even in winter, but the creme de la creme is the summer Salzburg Festival, which is quite the opposite of free. We of course partook in the local foods, both sweet and savory Tylorean style. Mozart Balls (yes) were on sale everywhere for obliging tourists…chocolate and pistachio truffles. 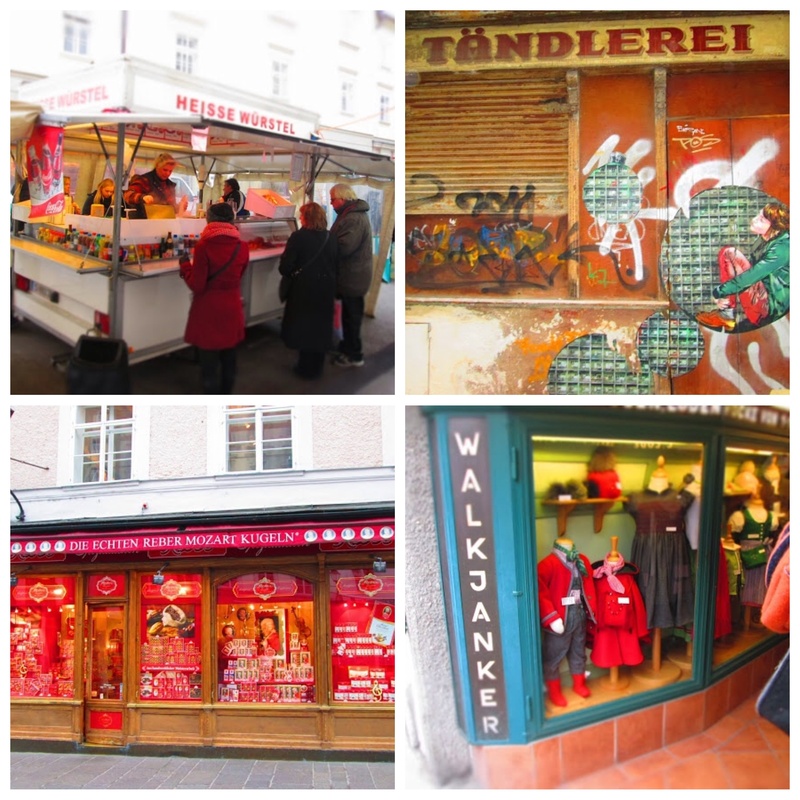 We visited a few würstleständes for sausage sandwiches that we ate while shivering in the cold. Our best discovery was a date night evening in a cozy bar with simply the best cocktails we’d had in many months, small bites and great conversation with the other clientele. I complimented a gentleman on his scarf (clearly a replica of the U.S. flag) and he shared that he recently became engaged to a Californian and the scarf was a gift from his daughter. 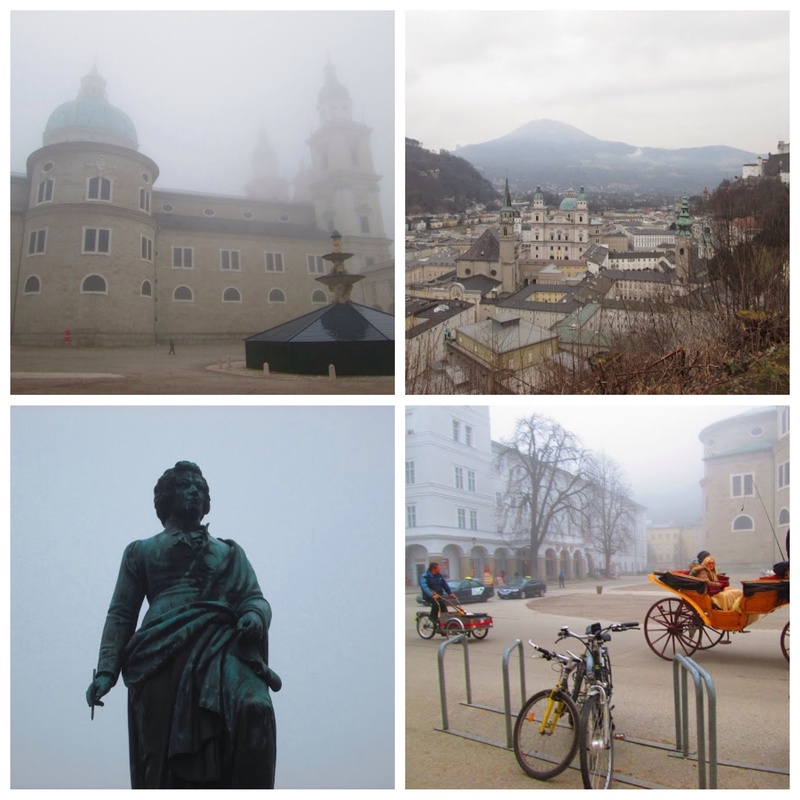 There’s so much in Salzburg we didn’t do….Mozart’s house, the salt mines, the Hohensalzburg Fortress. All the more reason to go back!